To all our clients, suppliers, and readers, Happy Holidays, and thank you for your patronage during the past year. We look forward to serving you in 2014. 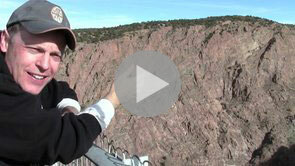 Sneak Peek: Cartier at DAM? Brilliant! 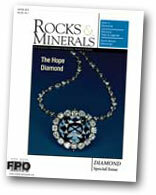 TGMS celebrates this time around with a theme, “60 Years of Diamonds, Gems, Silver and Gold,” and the journal Rocks and Minerals is celebrating the celebration with its January-February edition, devoted to the traditional 60th gift: diamond. 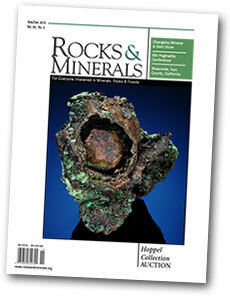 It features a who’s who of talent: researchers, curators, photographers, collectors, and more—many from the field of gemology as well as mineralogy. See abstracts for the following articles. In addition to being a center for learning, research and analysis, the Gemological Institute of America has a gem and jewelry collection, highlights of which are on display at the GIA Museum in Carlsbad, California. Currently exhibited are examples of work by the team of Tony Duquette and Hutton Wilkinson, to which we pointed last July, and fourteen pieces by Austin, Texas jewelry artist Zoltan David, whose floral design is pictured below. 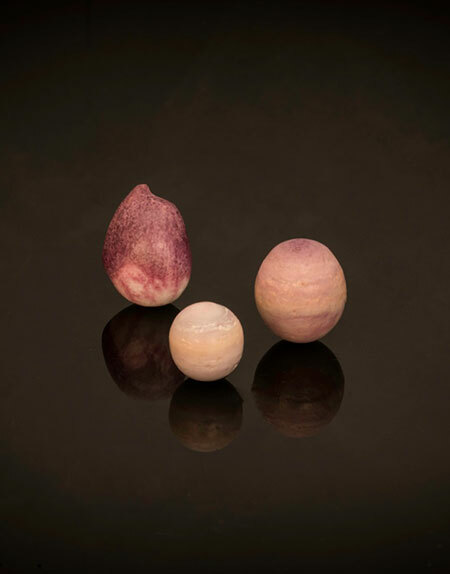 Fifteen sculptures by Peruvian artist Luis Alberto Quispe Aparicio are on display in an exhibit titled “Faces of Eternity.” Aparicio employs various gem materials, including peanut wood agate, labradorite, soap jasper and pink opal. 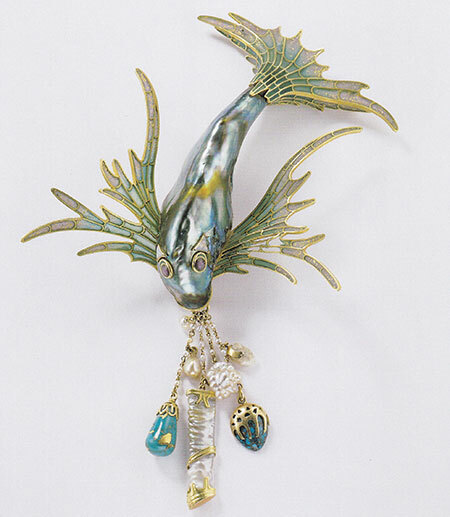 Single pieces in the GIA Museum collection beckon as well, like Kabuki Brooch, designed by Bali-based Carolyn Tyler, below. Tyler ran an advertising agency in Southern California before moving to Indonesia where she works with a team of master craftsmen. It may be nearly a year away, but Denverites and visitors can look forward to a holiday treat next fall with a homegrown show, “Brilliant: Cartier in the 20th Century,” produced exclusively at the Denver Art Museum, as announced last Tuesday. Focusing on the maison’s work from the first eight decades of the 1900s, the exhibition will feature 250 pieces: jewelry, timepieces (including the Egyptian striking clock pictured below) and more, as well as “his” items like cufflinks, cigarette cases, and Cartier’s signature tank wristwatch. DAM director Christoph Heinrich was quoted in a press release about the scope of the show: “The evolution of Cartier takes us on a journey through 20th century history, from the era of the last Czars in Russia to the Roaring ’20s in America to the onset of Hollywood glamour as we know it.” Heinrich explained to The Denver Post that the museum has never mounted such an ambitious jewelry show, which will include museum-quality creations owned by Elizabeth Taylor and the Duchess of Windsor (and heightened security). “Brilliant” runs from November 16, 2014 through March 15, 2015. Tickets will be available next summer. Since the show will not travel, you might want to. Front and center. Necklace worn by the Countess of Granard, Beatrice Mills Forbes, from a wealthy family that specialized in thoroughbred horse racing. Her brother, Ogden L. Mills, was Herbert Hoover’s treasury secretary. 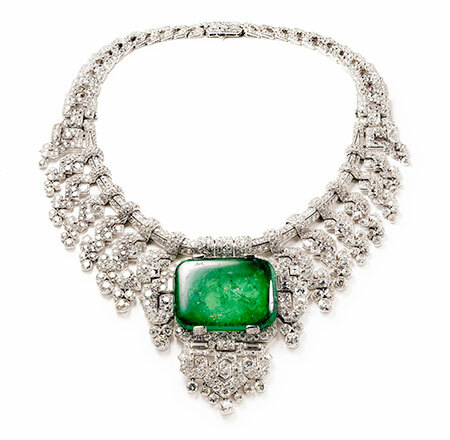 This necklace was a special order crafted in 1932 by Cartier London of platinum, diamonds and emerald. The center stone is a 143.23-carat emerald-cut cabochon. Height at center 8.80 cm. Cartier Collection. Tick-talking like an Egyptian. Any budding Egyptologists out there? We’d love to know whether the hieroglyphics are but the gibberish of the signer at Nelson Mandela’s memorial. Click for hi-res. La Doña. 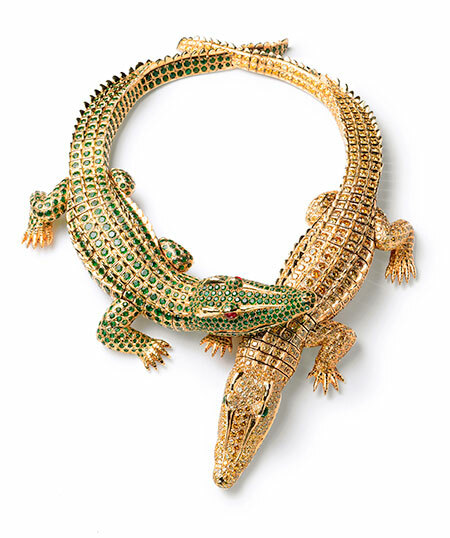 Below, it appears that Cartier engaged in some crocodile cannibalism, issuing in 2006 its La Doña de Cartier collection, the watch from which features scale-like band and croc-like trapezoidal case and face. Marketing included color images of a Félix stand-in. Like Countess Granard, Félix was involved in thoroughbred horse racing, by way of her last husband, French banker Alex Berger. We were in luck this month as our Mexican pearl broker passed through the office with a large and impressive selection of natural pearls from Baja California. It seems they have hit a new bank of oysters and other mollusks that is producing some of the largest scallop pearls and some of the finest oyster pearls we have seen. The first scallop pearl, or “lion’s paw” (below left, Inv. 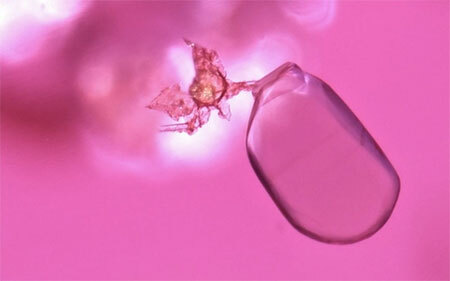 #21517), is an 18.97-carat drop with an intense purple top, blending into a white bottom. 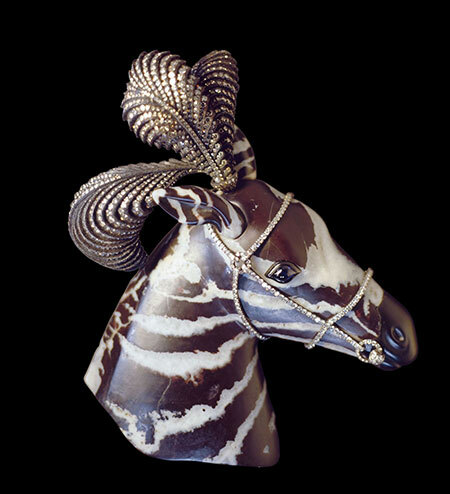 A very striking and impressive piece; the morphology is perfect for a pendant. This natural pearl is from the Pectinidae family. The second scallop pearl (below right, Inv. #21518) weighs in at a whopping 21.52 carats, and looks like a mini Jupiter, with swirls and bands of purple, mauve, pink and yellow. Full of character, with a pleasing blend of hues. This pearl is from the Spondylus calcifer species. The third scallop (Inv. #21539) is the 18.97-carat’s little sister, half the size, at 10.55 carats, with more lavender, yellow and light blue hues. A perfect accompaniment to the 21.52-carat, making a nice pair for a ring and pendant. 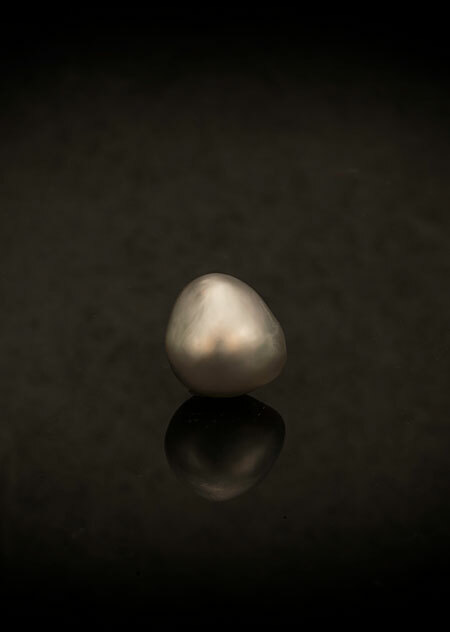 The fourth and most outstanding pearl is a 17.57-carat Calafia oyster pearl, also know as the La Paz oyster pearl and Pinctada mazatlanica. This species has been found from the Gulf of California all the way down to Peru. Its natural beauty rivals the finest of the cultured Tahitian pearls you see on the market, with a steely silver base featuring overtones of green, pink, blue…bringing it the appearance of peacock coloration. Price available upon request. See our previously featured scallop pear. And compare with Radiant Orchid…Pantone Color of the Year 2014. 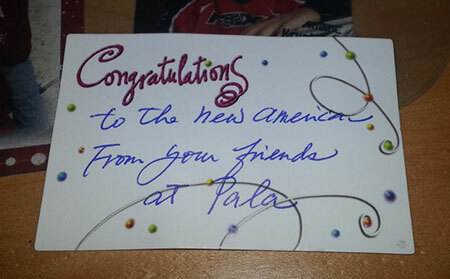 Last month, Mia Dixon, Pala International’s resident photographer became more than a permanent resident of the USA. 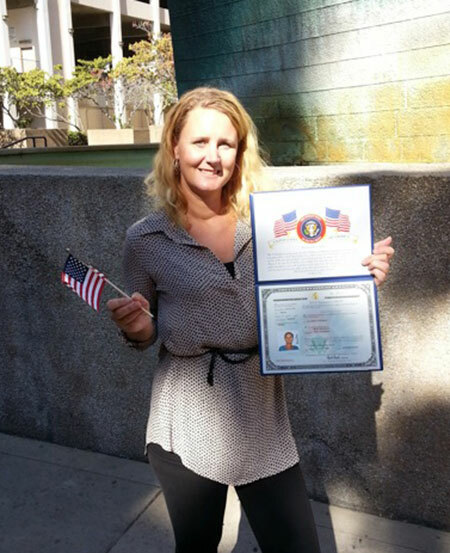 Mia, a native of Sweden, became an American citizen as she gave the Oath of Allegiance. The second commemoration regards the hundredth anniversary of X-ray diffraction, a method for detailed crystallographic study. Building upon the work of Max von Laue (who had discussed the challenge with Paul Peter Ewald), father-and-son physicists William Henry and William Lawrence Bragg theorized and then proved, via X-ray spectrometry, that crystalline material could be identified due to fingerprinting at the atomic level. 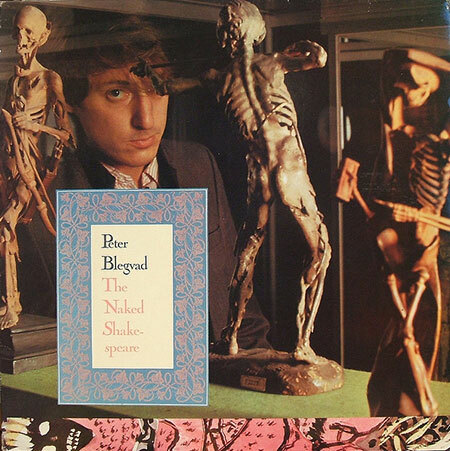 American musician Peter Blegvad, raised in Connecticut and England, stands beside a cabinet of wonder in the cover photo for The Naked Shakespeare, his first solo LP, released thirty years ago this October. Blegvad for a time worked with the band Henry Cow, which in 2009 released a 40th anniversary box set, buyers of which were given a bonus CD, A Cow Cabinet of Curiosities, featuring Blegvad on one track. We thought we’d toss this in for fun. 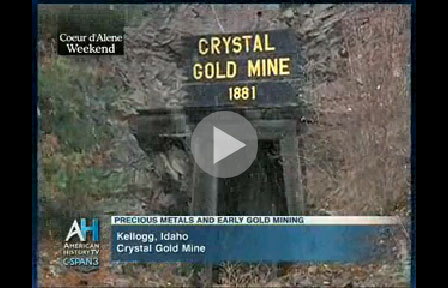 C-SPAN and mine owner Ray Cropp take you through the day of a hard rock miner in twelve minutes. 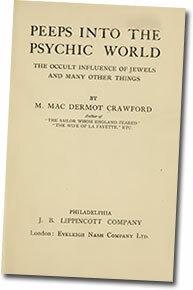 “The superstition that certain jewels attract misfortune to their owners is so rarely questioned that it has become an accepted belief….” With this, Bay Area-bred expatriate author Mary MacDermot Crawford begins her book Peeps Into the Psychic World: The Occult Influence of Jewels and Many Other Things, published nearly one hundred years ago (available here). 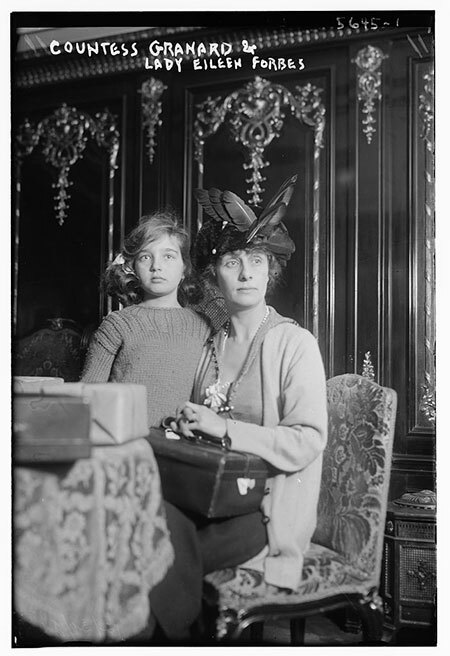 Whereas Crawford was the biographer of American naval hero John Paul Jones (1913) and of Adrienne de La Fayette (1907, 1908), wife of the American Revolutionary War general, in 1915 she turned her gaze to the psychic realm. Unconvincingly, she begins the book (only the first 45 pages of which really deal with the subject of its title) by turning to fiction, in the case of opal, to which the “taint of ill-luck clings,” by synopsizing Sir Walter Scott’s Anne of Geierstein, in which Hermione the Persian is rendered “a little heap of ashes” after a drop of holy water meets the “superb” opal of her hair clasp. Crawford then recounts how opal was prized in classical times, and how Queen Victoria gave these stones as wedding presents. Even the opals in Crawford’s collection had, “as yet, brought nothing but good luck. However….” And on and on. Worth a gander into the thinking of one post-Victorian mind and the sort of stuff being written not long before Hermann Hesse, in his own novel The Glass Bead Game, would label our era of attention-deficits the Age of the Feuilleton (i.e., the magazine). As a follow-up to last month’s nod to the Changsha show, we point to several items published recently by GIA on China, its market, its industry, its craftsmanship. 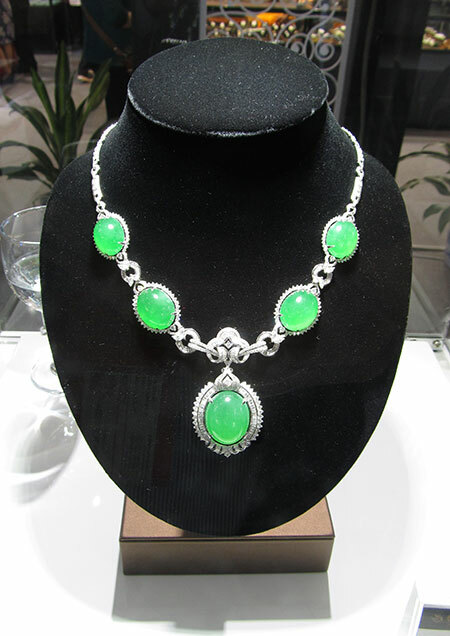 First, GIA senior industry analyst Russell Shor notes the skyrocketing demand for jadeite amongst wealthy Chinese buyers. Supply from Burma, however, has dropped, and the country’s regular gem auctions have been suspended due to armed fighting in jade land. Yet what has been produced isn’t getting into the market. Adding to a challenging situation are predictions that, even at the current rate of slowed production, reserves could be kaput in ten to twenty years. Read the full report here. 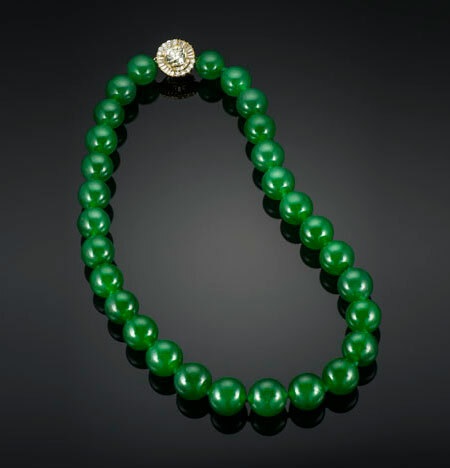 Just above in our newsletter, we pointed to a report from GIA’s Russell Shor that discusses Burma’s enigmatic shortage of jade. 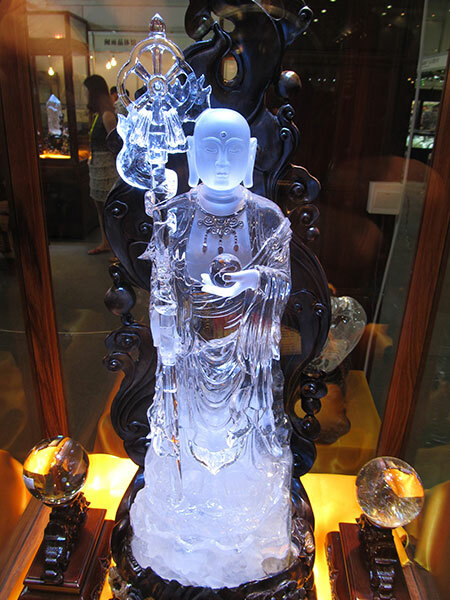 Also discussed in that report are Burma’s efforts to set up local jadeite carving and polishing operations, instead of sending raw material abroad. A week ago, The Irrawaddy published an interview with Thet Thet Khine, vice president of Myanmar Women Entrepreneurs Association who, when asked what she’d do to change economic policy if she were a member of parliament, answered, “Our country is full of natural resources, so the government shouldn’t sell out raw gems to foreign countries while they need money. We should produce value-added goods.” Presumably this notion comes from her experience as managing director of the gold and jewelry firm Forever Gems. She continued by mentioning the trickle-down effect such a policy would have. In fact, Burma’s foreign trade neared $16 billion in the first nine months of the 2013–14 fiscal year, up nearly $4 billion from the same period last year, according to a story yesterday by Eleven Media Group. Border security is credited for some of that jump. Value-added goods, while benefiting on the one hand, face the challenge of tariffs with a trading partner like China. Jade extraction may have been hampered by unrest in Kachin state, but people in Yangon/Rangoon attended an event that was seen as a move in the right direction regarding the armed conflict, as reported by The Irrawaddy on November 20. Kachin Independence Army deputy chief of staff, Gen. Sumlut Gun Maw, addressed a packed crowd in a Baptist church, discussing any prospects for a ceasefire, just as 2,000 villagers in Kachin were fleeing the fighting. Gun Maw also urged that Burma’s constitution be amended, giving greater autonomy to minorities. The fact that he was allowed to travel to Yangon was seen as a sign of trust, however feeble, between the warring parties. In his report, Russell Shor mentions the challenge faced by Burma of too-speedy extraction of jade. A potential impact on this issue is the fact that Burma is taking steps to join the international standard known as the Extractive Industries Transparency Initiative, or EITI. The initiative requires the following. Effective oversight by the multi-stakeholder group. Timely publication of EITI Reports. EITI Reports that include contextual information about the extractive industries. The production of comprehensive EITI Reports that include full government disclosure of extractive industry revenues, and disclosure of all material payments to government by oil, gas and mining companies. A credible assurance process applying international standards. 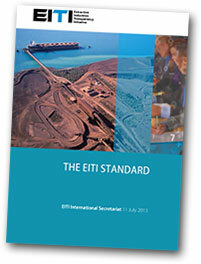 EITI Reports that are comprehensible, actively promoted, publicly accessible, and contribute to public debate. The multi-stakeholder group to take steps to act on lessons learned and review the outcomes and impact of EITI implementation. Below are recent items from our sibling publication, Pala Mineralis, that will be of interest to colored gemstone enthusiasts. Back in the late 1970s, your editor visited New York City for the first time (from Los Angeles), hoping to take in some of the iconic rock bands that were pushing the envelope at the time. A taxi deposited me in Little Italy in the midst of the neighborhood’s San Gennaro Festival. I had my first calzone and my first elbow-to-elbow experience walking through the jam-packed stalls. Who is this San Gennaro that he could bring the bridge-and-tunnel people (including myself, lodging in Jersey) to Mulberry Street to celebrate during the ten days straddling his September 19 feast day? Necklace of San Gennaro above (click to enlarge), in gold, silver and precious stones, created by Michele Dato in 1679. From the exhibition, “Naples’s Treasure: Masterpieces of the Saint Januarius Museum.” The necklace is meant to adorn a bust of the saint. 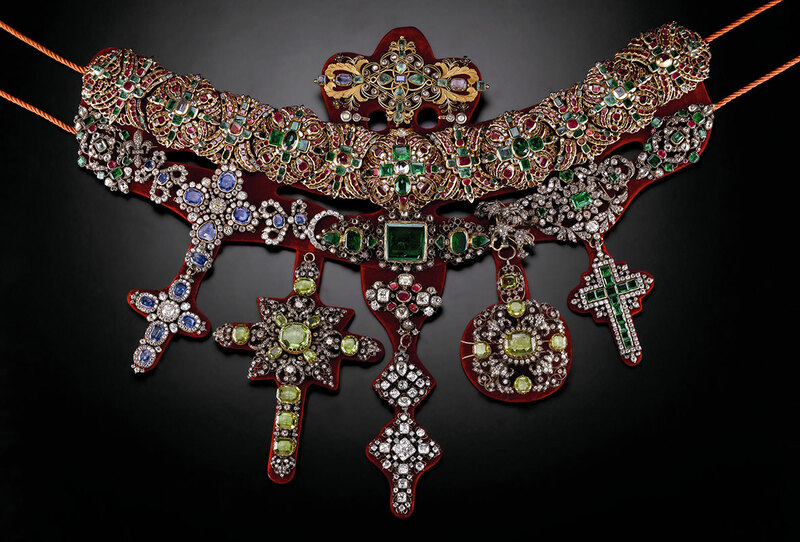 It is composed of jeweled crosses that were stand-alone beauties in their own right and originally took five months to craft. Other crosses and brooches from the 18th century were added later. 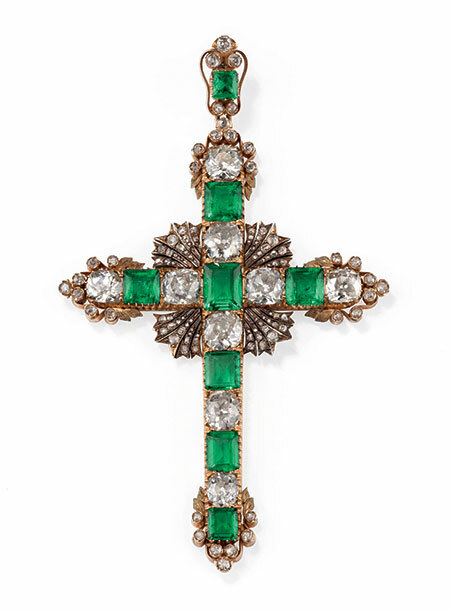 It also includes a ring given as an afterthought by Queen Marie Josè, consort of Umberto II, and an emerald cross from Napoléon. 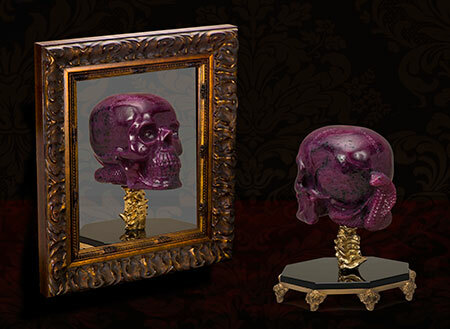 To this day, three times a year, his dried blood liquefies when the two antique crystal goblets in which it is kept are brought near his cut-off head—either an anomaly in nature or an ecclesiastical secret particularly well-kept. Gennaro would become the most popular Roman Catholic saint in the world. An exhibition press release states that his devotees number 25 million (and I think each and every one of them were there with me on Mulberry Street that September day three decades ago). 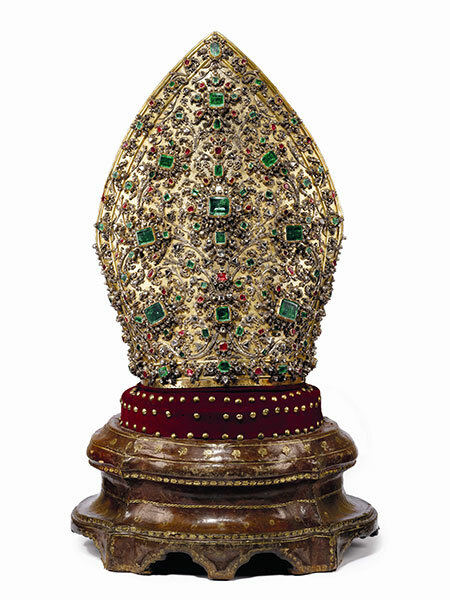 Pyx with jeweled cross above (click to enlarge), in gold, rubies, sapphires, emeralds and diamonds. The delicacy of its design is a fine contrast to that of the miter. It was offered by King Ferdinand II in 1831 and is of Neapolitan manufacture. 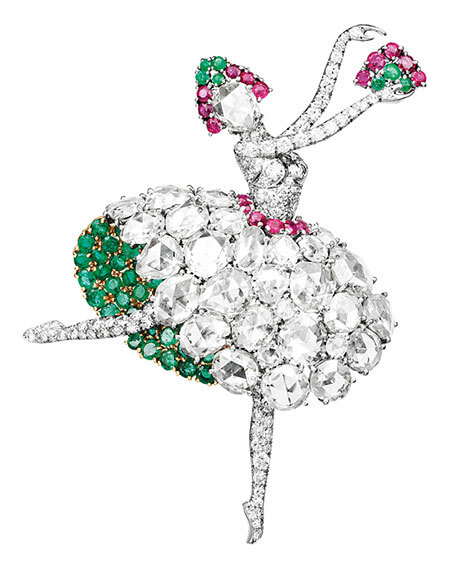 Pala International’s Bill Larson provided the following remarks in response to “A Quest for Beauty: The Art of Van Cleef & Arpels,” which spans over 100 years’ work in more than 200 pieces from the Place Vendôme High Jewelry Maison. 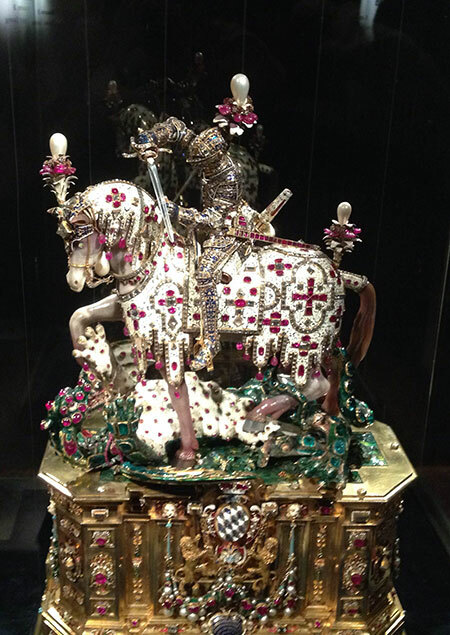 I went to visit the Bowers museum a week ago because I wanted to see the Van Cleef & Arpels exhibition, “A Quest for Beauty.” The exhibit is excellent and features wonderful examples of the jewelers’ work. It is well lit and well labeled, with great historical documentation accompanying much of the work. Adding intrigue and life to the pieces is the fact that many once were owned by celebrities like Barbara Hutton, Princess Grace Kelly and Elizabeth Taylor. For anyone who appreciates jewelry, fine craftsmanship is there to be seen, including the great zipper necklace, which can be turned into a bracelet! 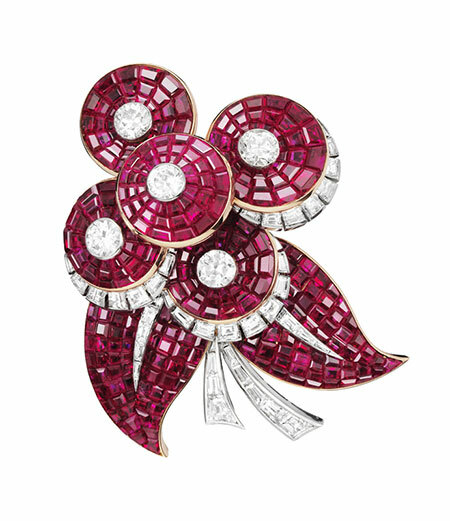 The invisible settings for which Van Cleef & Arpels are known are represented by amazing examples of the technique, including the famous chrysanthemum jewel in Burmese ruby. (See an example of this below.) 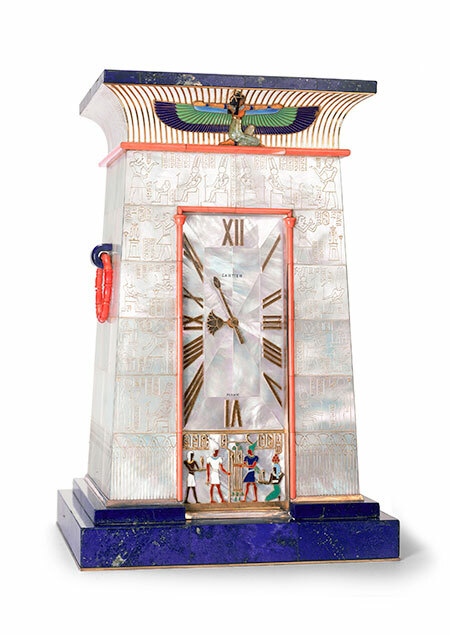 Also included are numerous objets d’art such as an amazing peacock box done in 1950 with lapis lazuli, which I imagine would be nearly impossible to duplicate today. The exhibition also features a short documentary film and a room displaying photos of the Van Cleef & Arpels artisans, demonstrating their dedication in creating some of the jewels. 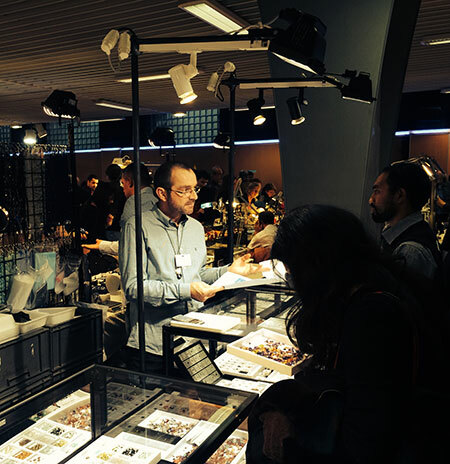 The exhibition was not overly crowded, but it was constantly busy. I was there for several hours and the comments were without exception extraordinarily positive. 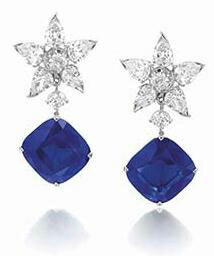 I would urge anyone with a love of beautiful jewels to visit the Bowers. Van Cleef & Arpels’s techniques were so innovative that they were patented, as was the Passe-Partout, pictured above, in 1938. This was a signature piece for the Maison in the late 1930s and 1940s. 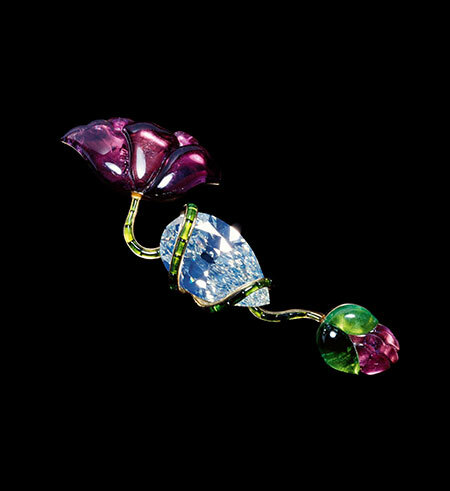 The jeweled blossoms mask a system of metal rails that allow the snake chain to slide in and out. Above, the piece is coiled as a bracelet, but it can be lengthened to serve as necklace, choker, opera-length necklace, bracelet, or belt. The flower clips can be worn by themselves, or as earrings. In 1951, the Maison created its Zip necklace, inspired by the closure system used in aviator jackets and sailor uniforms. The design was suggested years earlier, in 1938, by the Duchess of Windsor. The Pastilles clip pictured above is a superb example of Van Cleef & Arpels’s “Mystery Setting” method, which the jewelers patented in 1933. “The secret behind the Mystery Setting technique,” according to a press release, ”is a delicate lattice of gold ‘threads’ on which the stones—selected to very strict criteria—are positioned one by one to fit precisely into where they will be placed.” The method is extremely time consuming, taking hundreds or thousands of hours to craft a single piece. 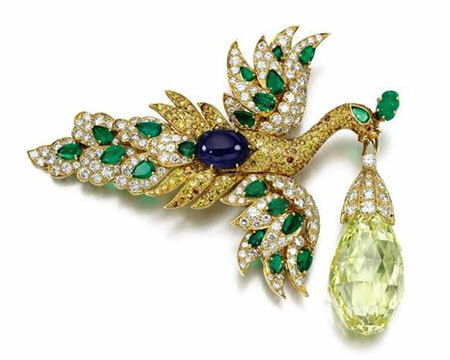 Dragon vanity case, above, Van Cleef & Arpels, 1923. Yellow gold, platinum, enamels, jade, diamonds. 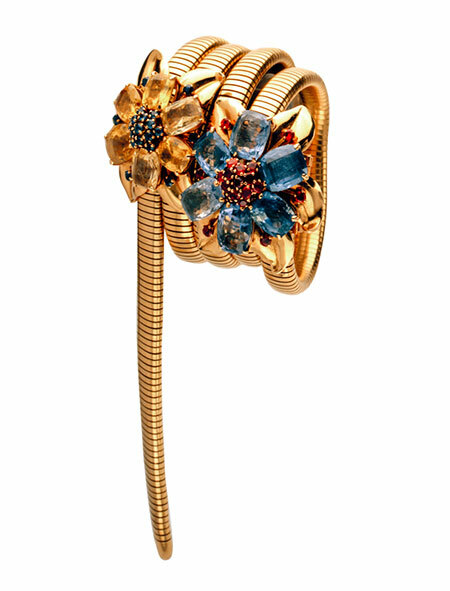 Van Cleef & Arpels Collection. 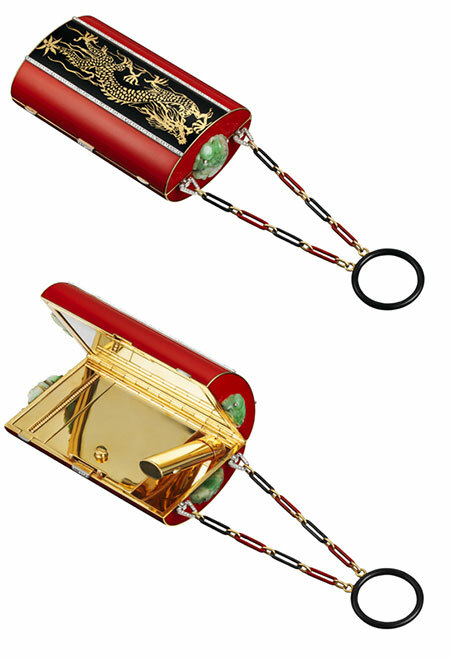 The cylindrical red enamel case is set with an enamel band with a gold dragon motif and rose-cut diamond border, opening to reveal four compartments, one with mirror and aide-mémoire cover with slide in pencil, a lipstick, a powder compartment and a vested case. The terminals are decorated with carved jade and diamonds details. A black and red enamel ring was used for handing. 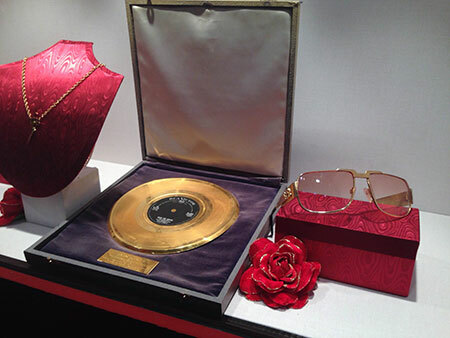 The vanity case is mounted in yellow gold and platinum. For thirty-five years, Joel A. Rosenthal, who works under the name JAR, has been offering jeweled creations on Paris’s Place Vendôme. He may be best known for his pavé technique, in setting small stones very tightly (using a dark metal alloy), in seamless carpets of stationary, undulating shapes, or articulated, dynamic forms. According to a 2006 profile in Forbes, upon moving to Paris after graduating from Harvard in 1966, Rosenthal tried his hand at scriptwriting and then needlepoint. 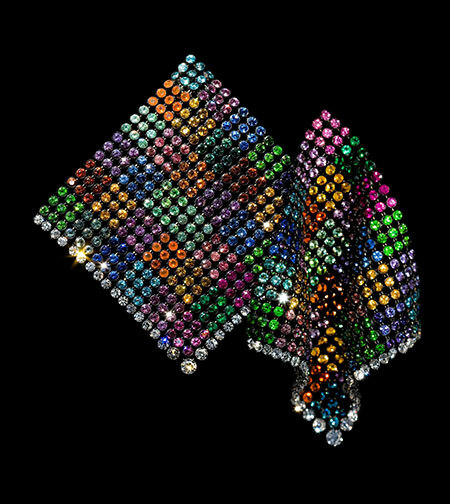 His first storefront was not devoted to jewelry but to “unusually colored yarn,” which attracted designers like Hermès and Valentino. His entry into gemstone designing came in the form of a request, not a personal whim. 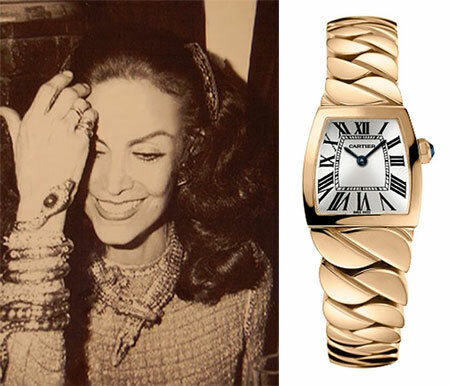 He then worked at Bulgari in New York as a salesman before returning to Paris in 1977 and designing on his own. For the first time in its history, The Metropolitan Museum of Art is devoting an exhibition to a contemporary gemstone artist, with “Jewels by JAR.” It also is the first JAR retrospective in the U.S.; only Somerset House in London mounted a major exhibition of Rosenthal’s work, in 2002. (That show’s lighting was dimmed, the visitors being given flashlights, according to Forbes.) This show, which opens on November 20, will feature more than four hundred works. The exhibition is accompanied by an affordable, slip-cased catalog featuring 69 images from the show. A pricier monograph, in two volumes, also is available. 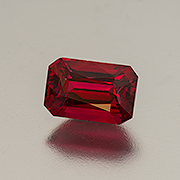 This month we feature not only a rare gem variety but also a gorgeous jewel. Danburite is not usually a gem that causes too much excitement, but this 51.29-carat screamer would catch the eye of any passerby. Reminiscent of a fine golden sapphire or an exotic Malawi yellow tourmaline, this danburite is sure to puzzle the gem connoisseur. Danburite is a silicate mineral found scattered throughout the planet in unassuming colors from pale yellow to brown. However, Tanzania is producing these neon yellow hues—color schemes completely unique to danburite. This intense golden yellow danburite comes to us from the Morogoro region in the Uluguru Mountains. In June we pointed to collections of photomicrographs of gemstone inclusions housed on the website of GGTL Laboratories (the merged enterprise of Franck Notari’s GemTechLab and Thomas Hainschwang’s GEMLAB [Liechtenstein]). The lab has issued two newsletters that may be of interest to our readers. 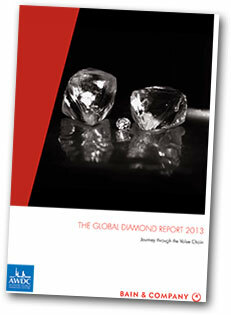 The September 2013 edition consists of a study entitled, “HIH: Multi-treated HPHT-grown synthetic diamonds showing some characteristics of natural diamonds.” The report comes after the lab detected yellow synthetics in parcels of natural melee diamonds. The synthetics had been treated with irradiation and HPHT—after having been grown via the HPHT (high pressure, high temperature) method. 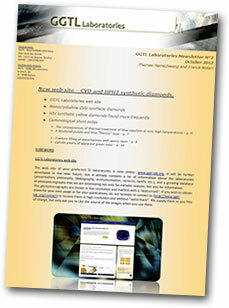 The October 2013 edition of the newsletter discusses a diamond, represented as a CVD (chemical vapor deposition) synthetic, which turned out to be natural. Also discussed are very high temperature heat treatment of blue sapphire, a bicolored purple and blue “Maxixe” beryl, fissure filling of aquamarine with epoxy resin, and calcitic pearls. Item: Last week, we received an email from the Diamond Manufacturers and Importers Association of America appealing for a conclave to discuss the matter of synthetic diamonds being represented as natural. 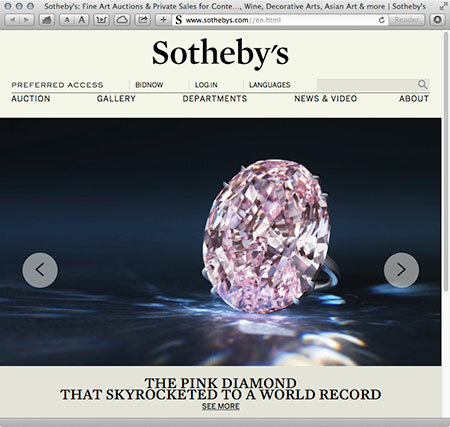 Long before Sotheby’s Geneva’s Magnificent Jewels sale was held on November 13, the auction house was touting the sale’s centerpiece, the Pink Star Diamond, as “the most valuable diamond ever to be offered at auction.” Indeed, the stone fetched $83.2 million, or $23 million more than the pre-sale estimate of $60 million, setting a world auction record for a diamond or jewel, in a sale that itself set the record for the highest jewelry sale total in history, at $199.5 million. 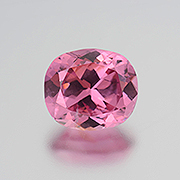 The Pink Star was purchased by diamond cutter Isaac Wolf, who renamed it “The Pink Dream.” It was cut from a 132.5-carat rough, mined by De Beers in Africa in 1999, and polished over a period of two years by Steinmetz Diamonds. The jewel was described as a 59.6-carat Internally Flawless Fancy Vivid Pink Diamond. It is the largest such diamond ever graded by GIA, which issued it a Type IIa classification. 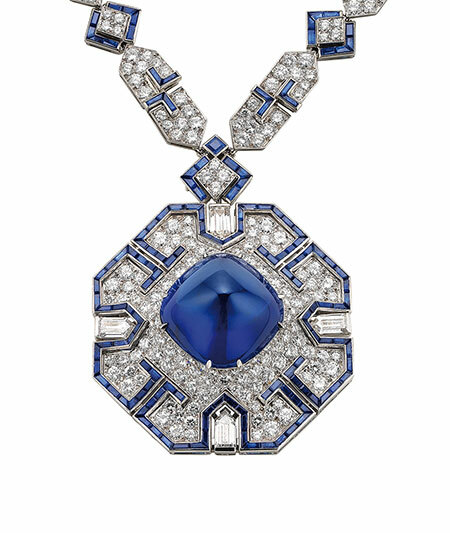 David Bennett, Chair of Sotheby’s Jewellery Division in Europe and the Middle East and Chair of Sotheby’s Switzerland, stated that the diamond’s size and color surpass diamonds in any known collection—State, Royal or private. It is more than twice the size of the 24.78-carat “Graff Pink,” which set a world auction record for a gemstone, at $46.2 million, in 2010. And the records kept on coming: a record for a pair of colorless diamond, at $9.2 million, and three more, pictured below. 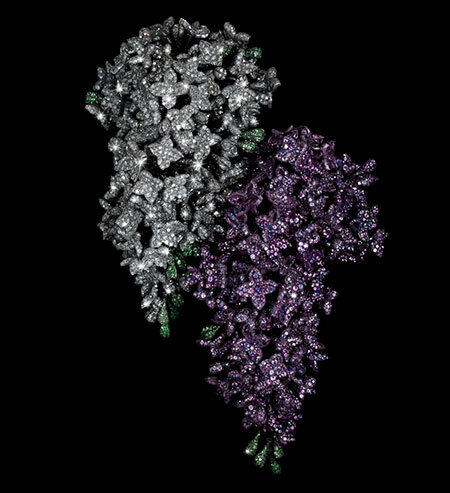 The day before the Sotheby’s sale, Christie’s Geneva offered its own colored diamond of a different hue. 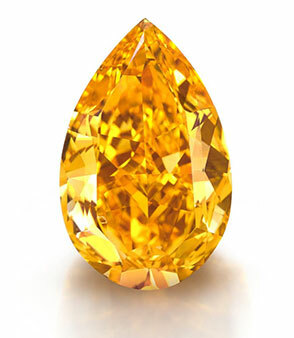 Dubbed simply “The Orange,” the largest Fancy Vivid Orange diamond ever to appear at auction. It weighs 14.82 carats and had a pre-sale estimate of $17–20 million. 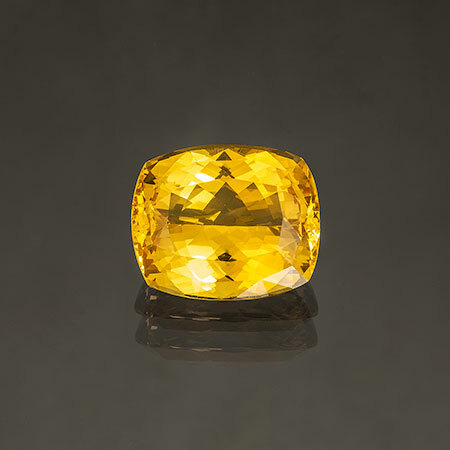 The stone achieved about twice that—$35.5 million—setting a world auction record for per-carat price for any diamond and, of course, any orange diamond. 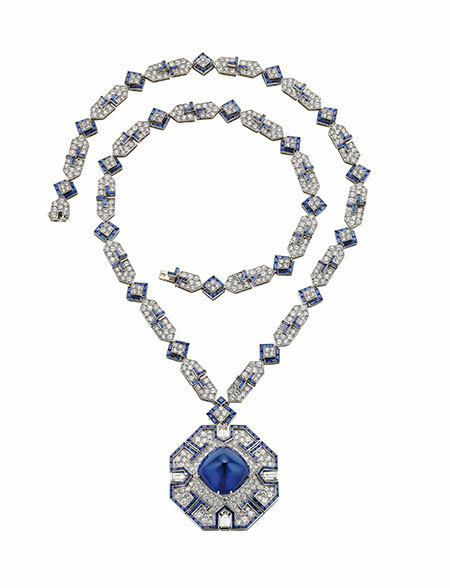 The Christie’s sale set another record for the highest total ever for a Geneva jewelry auction, at $125.3 million. That record was broken the next day by Sotheby’s, at nearly $200 million. Some exceptional jewels in the Christie’s sale might have shown more brightly if not overshadowed by the record-setting of Sotheby’s. Take for instance a piece by designer-to-the-stars Anna Hu. 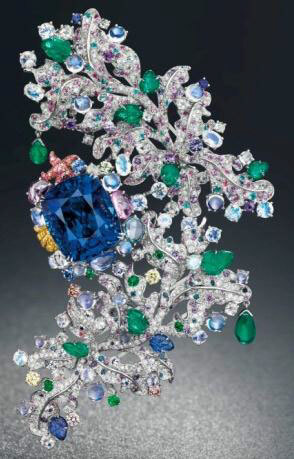 Her “Côte d’Azur” brooch features a 58.29-carat natural Burma sapphire, its heft balanced beautifully by a “pavé-set diamond floral branch decorated with moonstones, coloured sapphires, tsavorites, tourmalines, spinel, coloured diamonds, carved sapphires, carved and drop-shaped emeralds,” to quote the lot description. 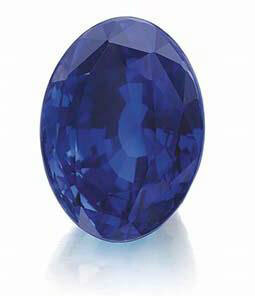 With a hammer price of $4.5 million, it set a world auction record both for per-carat price ($78,400) for a Burma sapphire and for a contemporary designer. 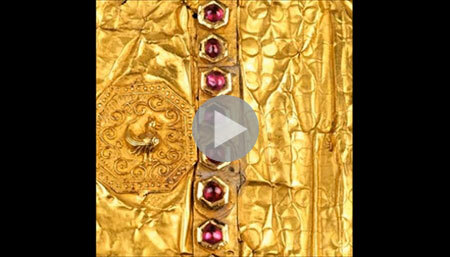 In April we noted the 2007 discovery of a “letter” fashioned from gold and cabochon rubies, encased in an elephant tusk, originally sent in 1756 from Burma’s King Alaungpaya to Britain’s George II. George couldn’t read it and had it sent to his hometown library in Hanover, Germany, where it languished for 250 years. There was talk last fall that a facsimile of the letter would be given to Burma, and today this was confirmed by a story in the Myanmar Times (MT). 2014 marks the 60th anniversary of diplomatic relations between Germany and Burma. (Diplomacy in 1756 seems to have suffered, in this case, even though the letter served as Alaungpaya’s permission for the East India Company to build a fortified base on Burma’s coast.) The 60th anniversary will be marked by bilateral cultural and educational activities as well as the opening of a branch of the Goethe-Institut, Germany’s cultural institution. Burma hasn’t had a Goethe-Institut since 1965. On Halloween, the American Chamber of Commerce (AmCham) did a little trick-or-treating by opening its Burma chapter in Yangon, as reported by Eleven Media Group. Compared with other western countries, the U.S. investment in Burma remains low. Importation from Burma of all products is now allowed, with the exception of rubies and jade. In the second half of the nineteenth century, French chocolatier Victor-Auguste Poulain brought his product out of the pharmacy and into the hands of children. Predecessor chocolatiers like Menier had produced the stuff as a medicinal powder. 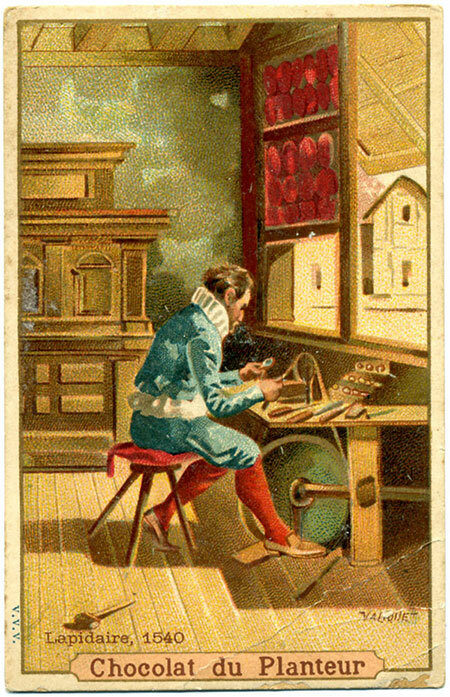 Poulain employed myriad marketing devices, including collecting cards. This month, with Pala Presents we offer five examples of these cards, from chocolatiers Poulin and Compagnie Coloniale as well as chicory vendor C. Beriot. See the full array here. Photo op. 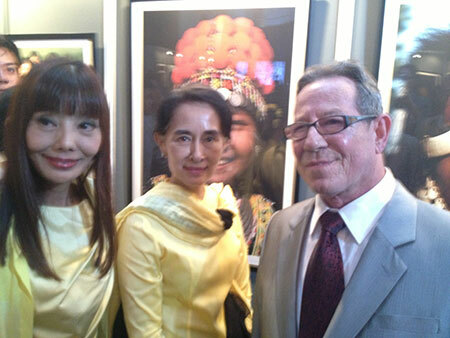 Pala International’s Bill Larson snapped this photo of Daw Aung San Suu Kyi after meeting her at the reception for photographer Richard Diran, right. Diran’s exhibition “The Vanishing Tribes of Burma,” was held September 28–30 in Yangon. For more on Bill’s trip to Burma, including Mogok, scroll down. The thrill. 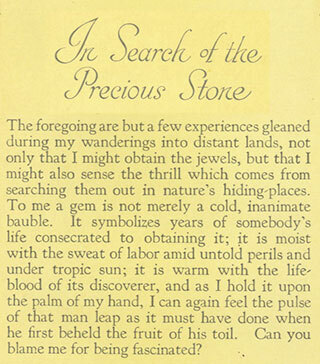 This month we feature a reprint of Albert Ramsay’s In Search of the Precious Stone, from which comes the closing quotation above—one of Bill Larson’s, favorites, which speaks to why he too loves gemstones and gemstone mining. 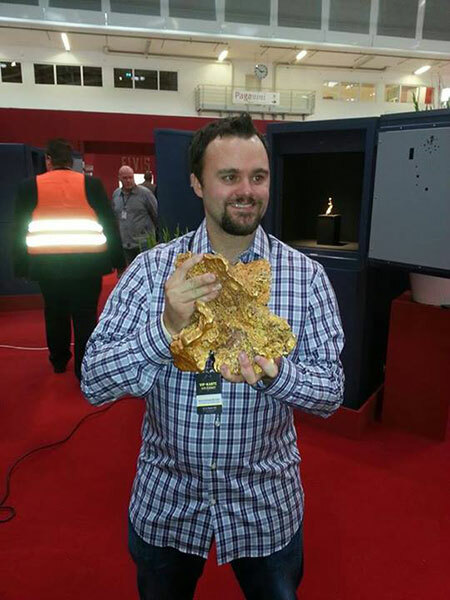 This year’s special exhibit—in honor of the show’s jubilee year—is titled “Gold.” It will feature the “Ausrox Gold Nugget” (world’s third biggest, 23.26 kg, 22 x 24 x 16 cm), “Screaming Man” (from Kurnalpi in Western Australia, 20.32 x 7.62 x 5.08 cm), and “Camel” (from Widgiemootha in Western Australia, 7 x 16.5 x10.16 cm). 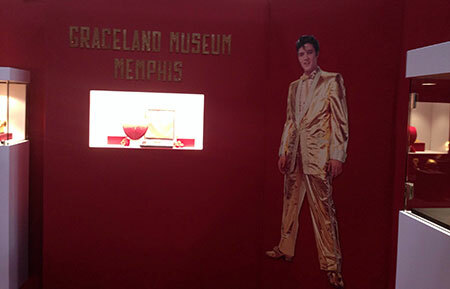 This exhibit will be covered in the Theme Book, a high-quality hardcover, which will include the show catalog. Both publications will be delivered from the show store beginning October 1. 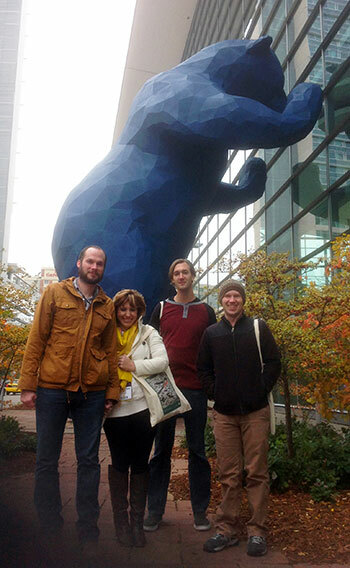 This year’s Denver Gem & Mineral Show took place in Denver just as nearby Boulder County was being pounded by rain. On September 12, the day before the show opened, the area was hit by 9 inches of rain, almost doubling the one-day record of 4.8 inches set in 1919. 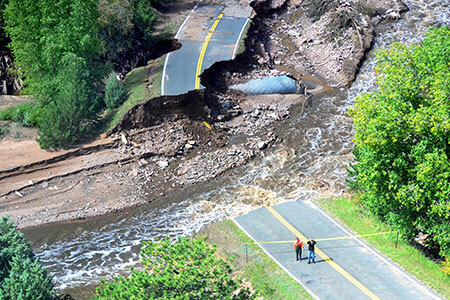 People in Evans, Milliken and Longmont still are displaced according to yesterday’s Denver Post. Buried (no pun intended) in a September 22 story was a paragraph that lauded the volunteers—including the Denver Show-goers. “Now we have to deal with the residue,” said [Boulder homeowner Nick] Krull, upbeat and radiating gratitude for the dozens of volunteers who helped out, including out-of-towners in Boulder for a jewelry convention who ditched the event for cleanup duty. 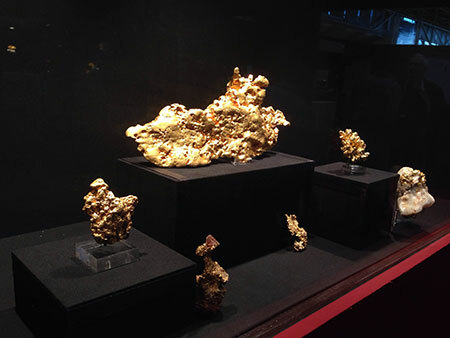 A new museum opened in Beirut, Lebanon on Saturday: the Museum of Minerals, aka MIM. The museum was conceived by Salim Eddé, Murex software cofounder, and assisted by the Jesuit University. It’s being compared with other world class museums. Read about it here. 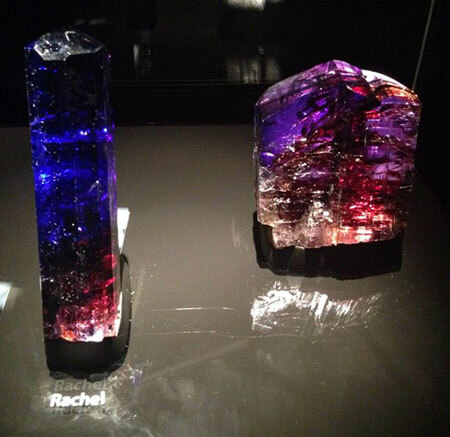 But of course, “Rachel.” These images were sent to us by Dr. Raquel Alonso-Perez, curator of the Mineralogical and Geological Museum at Harvard University. 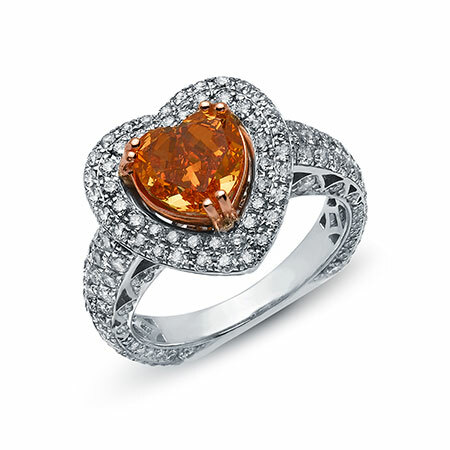 In the mind of a gem dealer or gem connoisseur, the favorite gem seems to be the next one. The thrill of unveiling a completely brand new stone is the fuel that keeps us pining for that ideal gem. That rush of the senses as you first lay eyes on a beautiful jewel is like no other. In this way the gem addiction rolls on and keep us wondering, Could there be another one even finer on the horizon? This one in front of me seems to be the finest, rarest, most colorful, but what else could lay in store, just waiting to be plucked from the Earth? 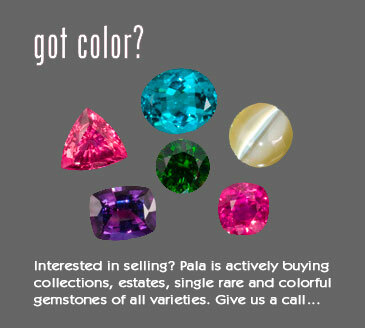 Being one of the biggest colored-stone houses in the U.S., we at Pala International are very fortunate to have new gemstones presented to us all the time. 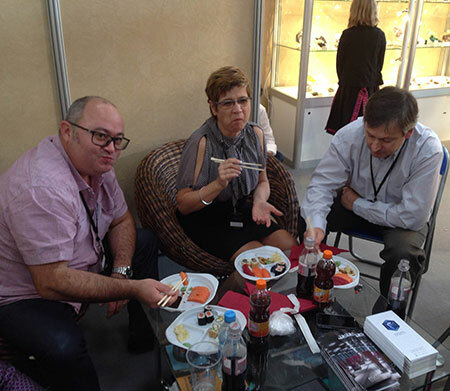 The mastermind behind Pala (Bill Larson) is even more fortunate to be able to travel the globe in search of the latest gemstones to enter the market. This month we feature a little sampling of Bill’s most recent finds in Thailand and Burma. 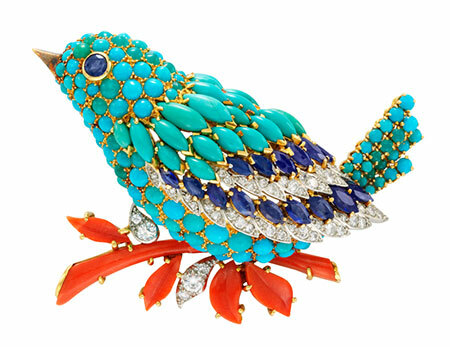 A delightful array of colorful, exotic, and phenomenal jewels…. Enjoy! The prolific Dr. Karl Schmetzer has produced two more studies of synthetic alexandrite, published in The Journal of Gemmology (Vol. 33, No. 5–6, 2013). The first study, “Synthetic alexandrites grown by the HOC method in Russia: internal features related to the growth technique and colorimetric investigation” (pp. 113–129; abstract here), is co-authored with Dr. Heinz-Jürgen Bernhardt, Walter A. Balmer and Thomas Hainschwang. Samples of HOC-grown material have been produced and marketed commercially since the mid-1990s, yet until the present study, no complete gemological description of the material has appeared. 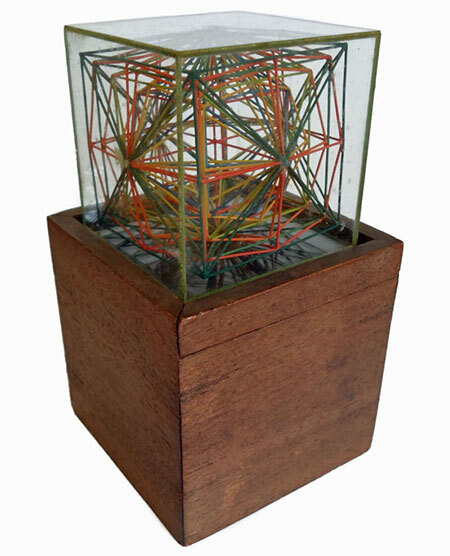 This material was developed by Vladimir V. Gurov at the Institute of Geology and Geophysics, Siberian Branch of the USSR Academy of Sciences in Novosibirsk, Russia. HOC is the acronym for the horizontally oriented crystallization method of growth, but when contrasted with the “vertical floating zone” growth method, which three of the authors wrote on last year, the HOC method could be viewed as the “horizontal floating zone” method. 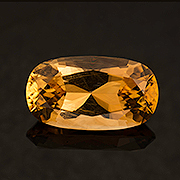 Synthetic alexandrites produced by this method exhibit color-change comparable to natural alexandrites produced in Hematita, Minas Gerais, Brazil, the most productive mine since the 1980s. Typically, this is an intense bluish green to blue green in daylight; in incandescent light it is violet purple or purple. 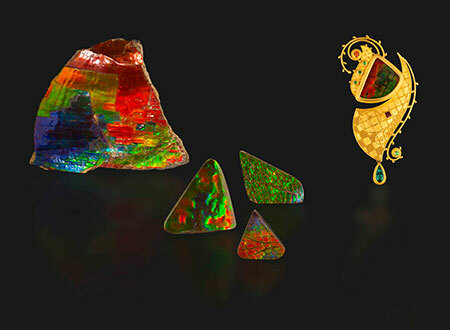 Interest in material produced for jewelry purposes began in the late 1980s and samples have been grown since the mid-1990s at the Institute of Geology and Mineralogy (part of what was the Institute of Geology and Geophysics) in cooperation with the Tairus company, also in Novosibirsk. The crystallization is facilitated by components that are similar to those developed in the 1970s for the growth of large corundum crystals, and the present study details the production technique in a sidebar. The researchers were given two samples. 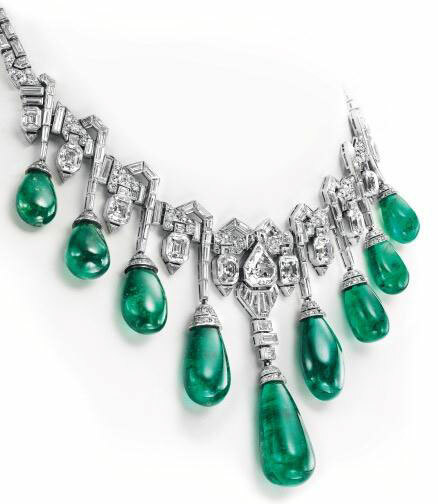 Seven faceted alexandrites originally from Tairus in Bangkok also were studied. All were compared against samples grown via the Czochralski method. Rough sample B, from which cut samples pictured above were taken, measured about 38 × 23 mm, thickness 14.5 mm, weight 39.2 g. A boat-shaped molybdenum container is used in the process, and the researchers were given schematic information by the producer that located the two samples in the container. Thus the researchers were able to verify the direction of growth and explain the morphology. The study expands on only limited information produced heretofore on inclusions in HOC alexandrites. In all the samples were found: curved growth striations and irregularly shaped or elongated cavities. Chemical properties were compared against those reported by Malsy and Armbruster (2012). Although different methods were used, the results were more or less the same, with—no surprise—chromium being the dominant color-change element, followed by vanadium (at about 75% that of chromium). Distribution between the two was random. Given the fact that color change is alexandrite’s claim to fame, the study spends nearly a third of its pages on color. The HOC samples, according to the authors, were ideal for colorimetric study due to the paucity of variation in chemical composition within the samples. 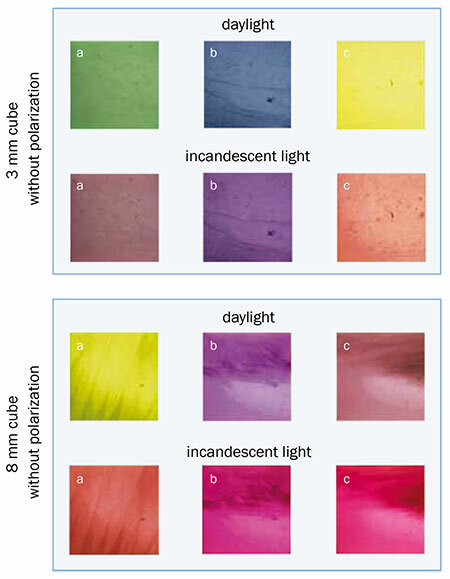 Color change in alexandrite depends on (a) the direction of observation of a faceted stone or rough relative to its orientation to the a, b and c crystallographic axes; (b) the content of trace elements that cause color change; and (c) the length of the path of light within a sample, relating to thickness (also described as Usambara effect in gemology). Factor (c) is dramatically demonstrated in the figure below. The photos illustrate three different color phenomena, which haven been often mixed erroneously: pleochroism (due to different orientation of samples), alexandrite effect (due to different light sources) and Usambara effect (due to different thickness of samples = path of light within the samples). Absorption spectra were graphed and discussed as well as results of infrared spectroscopy. In comparing the HOC material with Czochralski-grown synthetic alexandrite, there was no significant difference in infrared spectra. The two also exhibit curved growth striations and gas bubbles, but somewhat differently shaped cavities. If you were curious about synthetic alexandrite grown by the Czochralski method, mentioned above, Dr. Schmetzer and co-authors Dr. Heinz-Jürgen Bernhardt and Thomas Hainschwang discuss this, and chrysoberyl grown by the same method, in a second article published in the same issue of The Journal of Gemmology, “Titanium-bearing synthetic alexandrite and chrysoberyl” (pp. 137–148; abstract here). 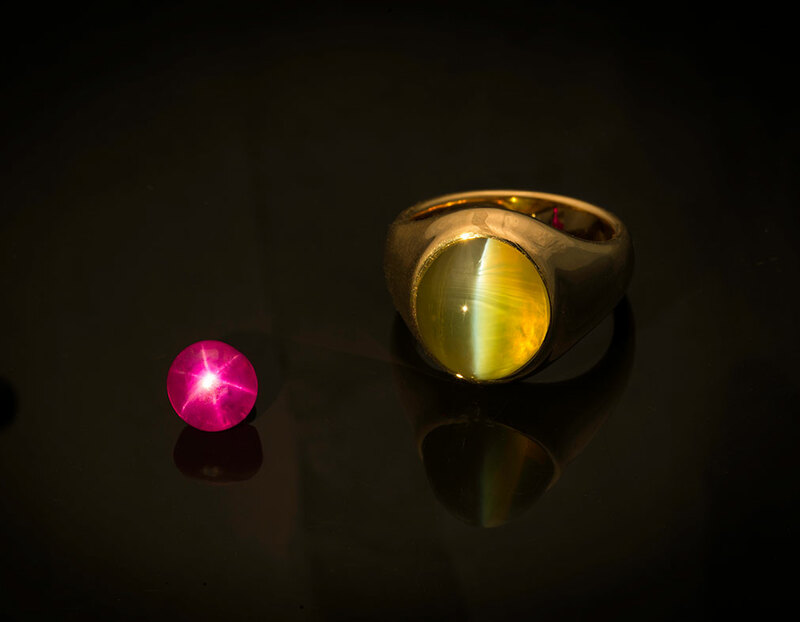 In the late 1980s, synthetic alexandrite cat’s-eyes produced by the Japanese firm of Kyocera emerged on the market under the trade names “Inamori synthetic alexandrite” and “Inamori created alexandrite.” This synthetic material, when cut as a cabochon in a particular direction, usually exhibited a well-centered cat’s eye light band. In 1987, R. E. Kane reported (Gems & Gemology, 23:3, 158–62) that, under a strong, single incandescent light down the long direction, asterism could be seen. 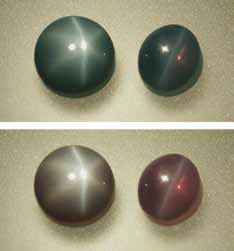 As shown at right, a cabochon can display asterism when cut with its base perpendicular to that producing a cat’s eye. In their 2011 study of synthetic star alexandrite (Gems & Jewellery, 20:3, 9–11), Dr. Schmetzer and Alan Hodgkinson found that the studied stones, when examined microscopically in immersion, did not show exactly the same pleochroism that earlier had been seen in synthetic vanadium- and chromium-bearing alexandrite. Preliminary spectroscopic examination also showed differences to the absorption spectra that were expected for such chromium- and vanadium-bearing, iron-free samples of synthetic material, which had higher chromium than vanadium contents. The search was on for another color-causing trace element, but the data showed only chromium, vanadium and titanium. The latter was thought to occur in the form of rutile precipitates, which cause asterism and/or chatoyancy. 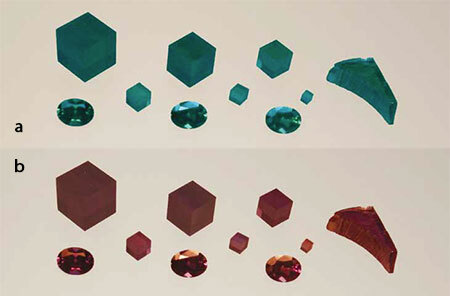 A review of the relevant patent literature shows different production techniques for synthetic alexandrite cat’s-eyes. 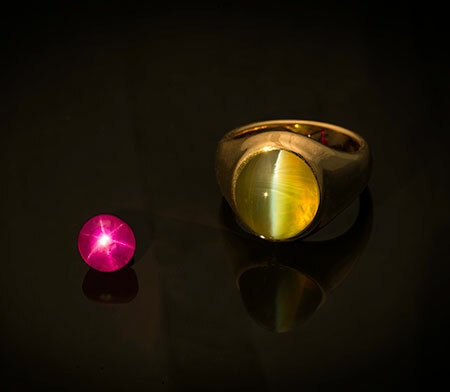 One of these techniques for the production of alexandrite cat’s-eyes involves a two-step growth and annealing process. The first step includes the production of homogeneous single crystals containing titanium oxide as dopant. It is claimed that such specifically-doped crystals can be grown by any known technique suitable for the crystal growth of chrysoberyl, but the floating zone method is described in detail. Crystal growth is performed under argon, nitrogen or hydrogen atmospheres and titanium is present in its trivalent state. In the second step, annealing of the crystal at elevated temperatures in an oxidizing atmosphere is performed. During this second part of the process titanium is oxidized and elongated particles, most probably rutile needles, are precipitated. These exsolved particles are responsible for the chatoyant effect of the material when cut as a cabochon. 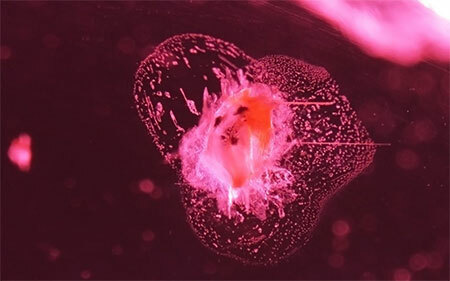 A process assigned to Kyocera Corporation describes the production of chrysoberyl cat’s-eyes with a similar first step growth process using a specific dopant. In contrast, a subsequent heat treatment step is not directly mentioned. The present study discusses the role of trivalent titanium (Ti3+) in synthetic crystal materials. This contrasts with natural material; in most rocks and minerals titanium occurs only as Ti4+, with trivalent titanium being unstable. The study continues, investigating the role of Ti in the Kyocera chrysoberyls and alexandrites, irrespective of their asterism or chatoyancy. 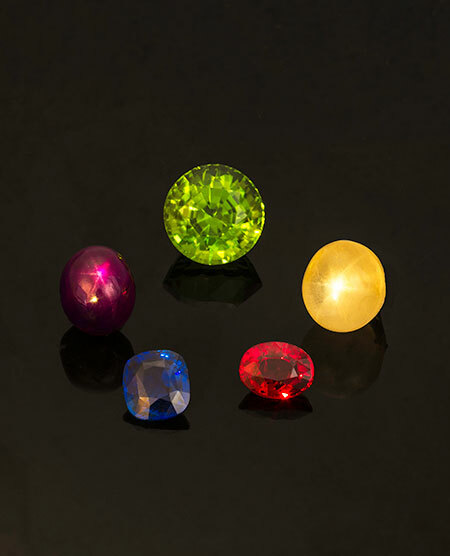 The samples studied were (a) reddish-violet chrysoberyl rough-cut crystals and faceted stones (without particular orientation) from Kyocera Germany, evidently originally from rough Czochralski-grown crystals; (b) alexandrites from Kyocera, both rough-cut crystals and faceted stones; and (c) alexandrite cat’s eyes and stars prepared by A. Hodgkinson from a synthetic crystal originally purchased in 1988, with two samples displaying 6-rayed stars and one displaying a cat’s eye. Also in (c) were two more cat’s eyes from George Bosshart’s private collection. The researchers performed chemical analysis, absorption spectroscopy, examined growth striations, chatoyancy/asterism and pleochroism, all of which is documented in the detail for which Dr. Schmetzer and his colleagues are known. The main results of the study show that titanium is present in synthetic alexandrites cat’s-eyes and asteriated alexandrite of Kyocera Corporation in two valence states. Needle-like precipitates, most probably rutile needles with titanium in its tetravalent state, are present in three different directions. 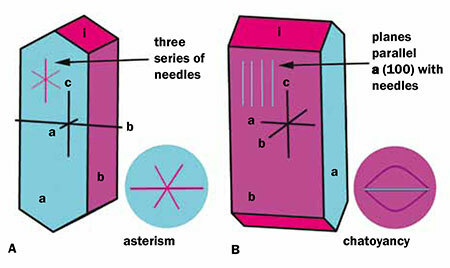 According to the orientation of the cabochons, six-rayed asterism or chatoyancy is observed. The color of the samples is due to a combination of chromium, vanadium, and titanium, with titanium present in its trivalent state. This is similar to some Kashan synthetic rubies, in which titanium (in addition to chromium as main colour causing trace element) is also present in its trivalent state. Collectors of mineral specimens will recognize the locality of Chamonix as producing lovely fluorite and smoky quartz. But on September 9, Chamonix (located where France touches both Switzerland and Italy) produced as much as €246,000 worth of rubies, sapphires and emeralds. According to reports by CNN and Planetmountain.com, a young climber ascending the Bossons glacier (on the southeastern side of the Chamonix valley) came upon a metal box in the snow. Such a sight is common in a glacier, which regularly regurgitates anything left on its face. For this alpinist the box was anything but common: it held several bags stamped “Made in India” containing the aforementioned gemstones. The anonymous climber turned the cache in to police in Bourg-Saint-Maurice on September 9. 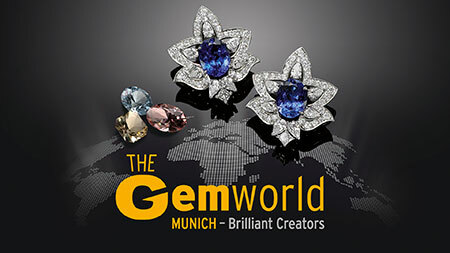 Police now are charged with determining the gems’ ownership. The task is facilitated, however, by the fact that the stones likely came from one of two airplane crashes that were recorded in the area in the last century. In 1950, Air India charter Flight 245, the “Malabar Princess,” crashed into Mont Blanc, situated above the glacier, killing all 48 passengers and crew. The plane’s destination? A stop in Geneva, between Mumbai and London. The second crash occurred in 1966. Air India Flight 101 was bound from Mumbai to New York. If this was the plane that carried the precious cargo found last month, one among its 106 passengers was precious enough himself to warrant a raised eyebrow. Killed in the crash was Homi Jehangir Bhabha, known as “father of India’s nuclear program,” and news of his death was received with an obligatory conspiracy theory: surely the CIA had engineered Bhabha’s death in order to cripple India’s nuclear weapons program. As we know, the program hardly was crippled. A year-long investigation into the crash cited human error on the part of the pilot-in-command. 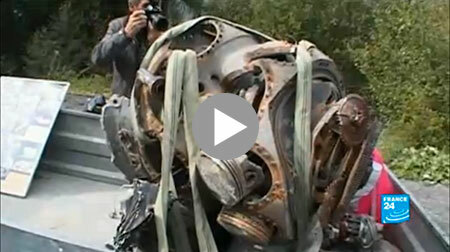 Parts of aircraft and even human remains regularly make their way towards the Chamonix valley floor, as shown in this brief streaming video. It’s been over a year since we looked at progress at Shree Padmanabhaswamy Temple, the treasure vaults of which have been inventoried for the last two years. Quite a stir was caused when the temple’s riches came to light through a legal battle that began in 2007, as we noted in July 2011. The most recent reports, from this past July, were from a leaked document, dated May 30, claiming the temple’s administrative officer “had made many lapses earlier in maintaining the temple properties and many allegations of corruption connected with the temple are existing against him,” according to The Hindu. Stewardship of the temple’s treasure was exactly what had caused the late T. P. Sundara Rajan to take the issue before India’s Supreme Court; that court ordered the audit. On August 3, temple management countered the leaked report. 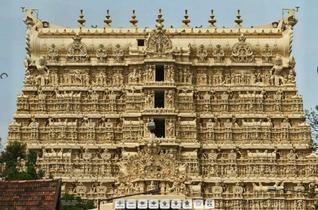 Screenshot of an ambitious 360-degree zoomable “virtual tour” of the Shree Padmanabhaswamy Temple by Kerala photographer Leen Thobias, whose accomplishment was noted by The Hindu. The project required 1,600 high-res images. In May, Architecture Professor, Binumol Tom, of the College of Engineering, Thiruvananthapuram, wrote his own plea for careful consideration regarding the temple’s architectural (and spiritual) integrity, in the face of needed renovation. 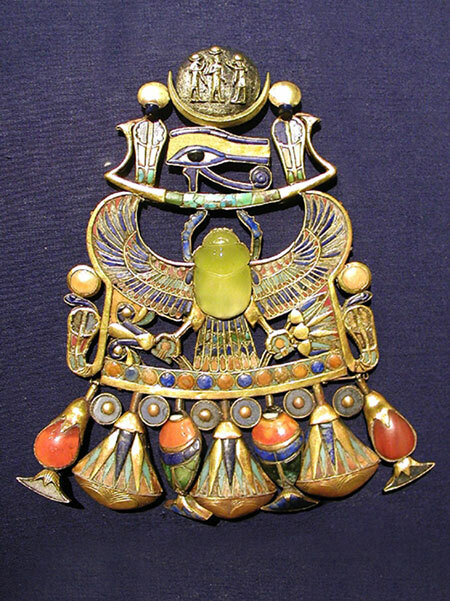 Details of the gemstones in the temple treasure came out in a Hindu story April 13. The story discussed the seventh interim report on the inventory, including the following. Last December, the auditors were granted nine more months to complete the inventory, according to The Hindu. 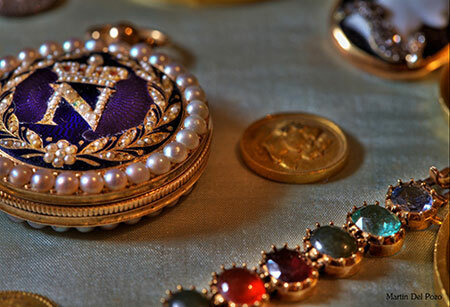 An earlier October 25, 2012, story, stating that the inventory would be completed by August 20, 2013, mentioned that the necklaces (sarappollimalas) found in Vault A contained lockets encrusted with rubies, diamonds, emeralds, cat’s eyes, pearls and coral. 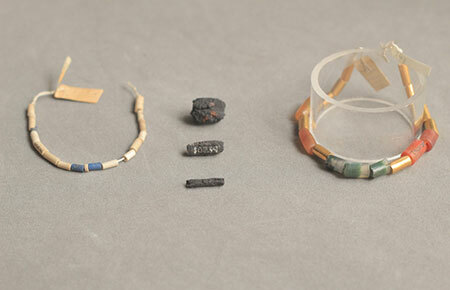 The story discussed a report that only 30–35 objects could be documented in a day. In Vault A, which holds the most valuable articles, that number was reduced to 2–4 objects per day. Pala International’s Bill Larson has returned from Burma and has the photos to prove it. When he wasn’t brushing elbows with the likes of Aung San Suu Kyi he was getting those elbows dirty in the mines of Mogok. See it all here. This news is a little old, but…. In May of last year we noted that the European Union had agreed to lift sanctions against Burma for twelve months. This year, the EU made the lifting of the sanctions permanent, as reported on April 22 by BBC. Aung San Suu Kyi was quoted as saying that it was time for the sanctions to be lifted. 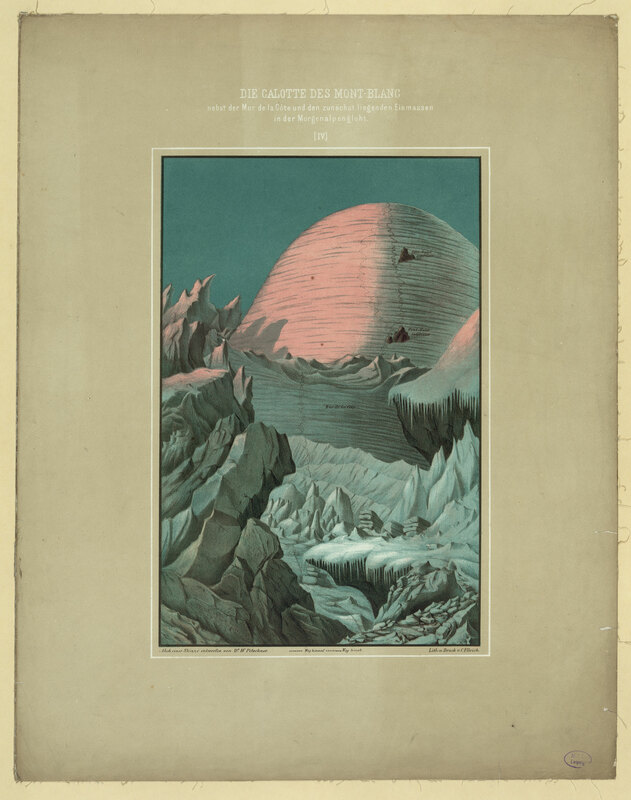 This month’s text, In Search of the Precious Stone, was published privately by Albert Ramsay in 1925. 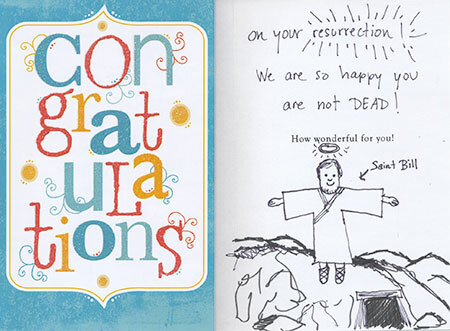 Given its illustrations and artful layout, we offer it in facsimile form. 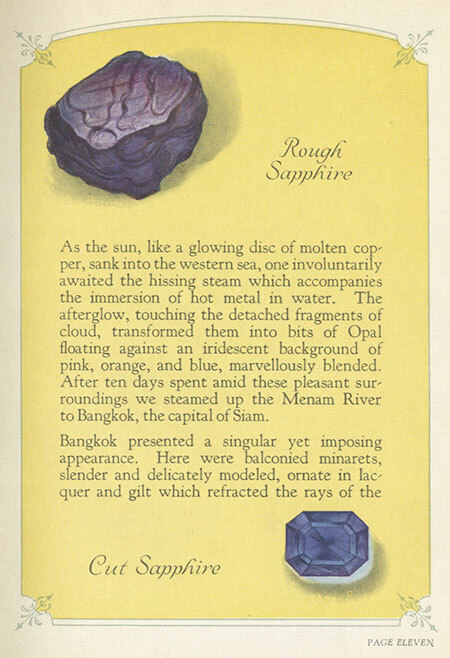 A page from In Search of the Precious Stone, in which Ramsay covers opal, sapphire (including star sapphire), ruby, cat’s eye and emerald. 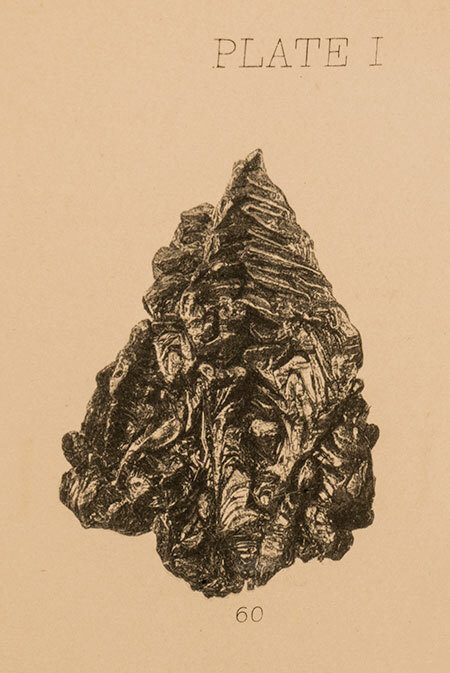 For more information on meteorites in Egypt, as well as the contribution one made to King Tutankhamen’s necklace, visit the UCL Museums & Collections blog. BlueCap Productions has released the What’s Hot In Tucson 2013 two-DVD set. (Click for outtakes.) To receive a 10% discount, just enter the code palaintl when you’re asked for it while ordering. In 1985, your editor toured Europe with a fine volunteer choir under the baton of Frank Brownstead, now director of music at the Roman Catholic cathedral in Los Angeles. 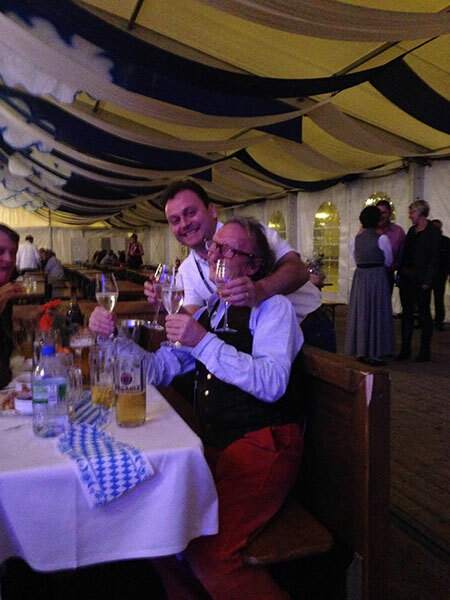 As I wrote two years ago in our sister publication, Pala Mineralis, we choristers were a little miffed at beginning the tour at the Pius Church in Meggen, Switzerland, just outside Lucerne. We already were crabby from mistakenly opting for a bus with forced-air rather than real A/C, only to arrive for our first concert at what appeared to be an industrial park. Until the hour of our performance we hadn’t understood that the church’s white marble walls (from the same source as the Acropolis) would transmit a gorgeous honey light at sunset. All was forgiven. The next night we time-traveled to the shores of Lake Como, singing in the Chiesa San Giorgio, the Medieval ancestral church of our tour director. I still remember the grand but decrepit fresco on the wall of (I think it was) the church hall, depicting an armored figure with Gothic angularity—perhaps St. George himself. Then we were off to Florence to sing a Mass at the cathedral, Il Duomo. There was leisure time, too. The dollar was strong, as I recall, else how could we have dined so lavishly at a Florentine ristorante whose patrons were adorned in jewels I’d only seen in magazines? This was the period when Bulgari offered those opulent and, what looked in the ads to be, hefty chokers and necklaces, often incorporating antique coins. The firm itself calls this design element “a sense of volume.” Having been skeptical, I was fascinated to see that what appeared to be unwearable on the page, in life looked dramatic yet dignified on the necks of women dining on piatti of prosciutto e melone and gnocchi al coniglio against stone walls as ancient as the Bulgari family’s inspirations. The designs on exhibit contributed to the “Italian school,” but there may be some surprises along the way. The release includes a quote from Andy Warhol: “I always visit Bulgari because it is the most important museum of contemporary art.” But, per the press release, Bulgari did its own borrowing from the the world of popular culture. Remember Raquel Welch’s stars-and-stripes (and Stetson) outfit from the film Myra Breckinridge? 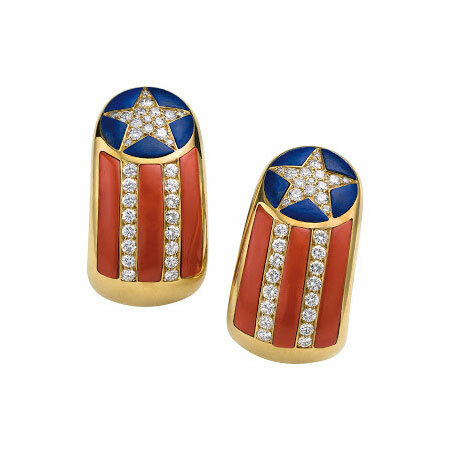 Martin Chapman, a curator at the Fine Arts Museums of San Francisco sees a link between such pop iconography and Bulgari’s incorporation of Old Glory in a “whole range” of such designs. 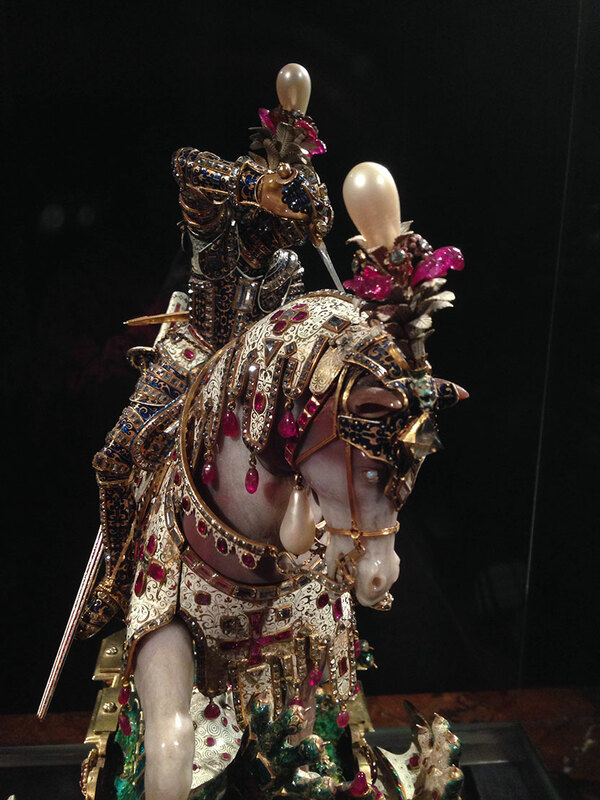 The V&A and Qatar Museums Authority have teamed up for an exhibition, “Pearls,” which opens this Saturday. The V&A website is not being stingy in its preview of what’s in store, with the exhibition pages filled with teasers to tempt your attendance. What you won’t see represented may lure you in, if you needed it: on display will be a pearl-drop earring worn by Charles I at his 1649 execution, and a necklace of cultured pearls given to Marilyn Monroe by Joe DiMaggio in 1954. The significance of pearls has morphed through time. In antiquity, they were indicative of the owner’s rank and wealth. In medieval Europe, they became a symbol of purity and chastity. 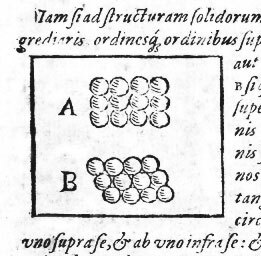 And “lunar” is the first association Pearl receives in J. C. Cooper’s An Illustrated Encyclopaedia of Traditional Symbols. Both became linked with the Virgin Mary, who is enshrined at the moment of her annunciation in the 14th century Hylle Jewel, included in the exhibition. It is crafted in the form a crowned Lombardic initial “M,” ingeniously utilizing the spaces between the letter’s verticals as Gothic windows framing Mary and the angel Gabriel. 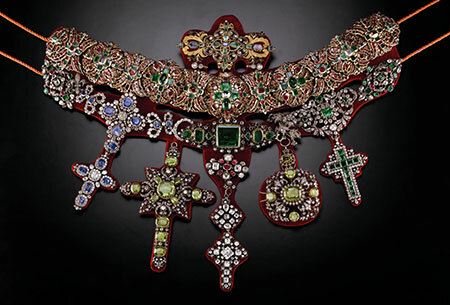 The verticals (the window’s mullions) are encrusted with several pearls as well as rubies, emeralds and rough diamonds. 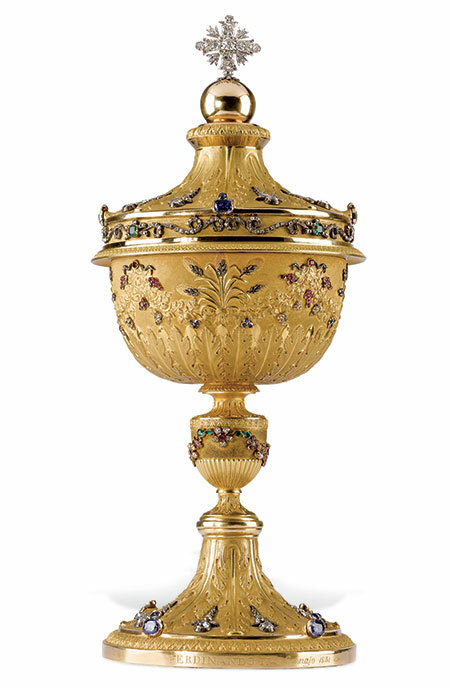 The central mullion is decorated with a ruby in the shape of a rather pregnant vase from which springs three lilies—sans stamens, of course—another of Mary’s symbols. With the Renaissance, and attendant affluence, pearls are to be found in the portraits of the rich and powerful, portraits that are displayed in the exhibition. 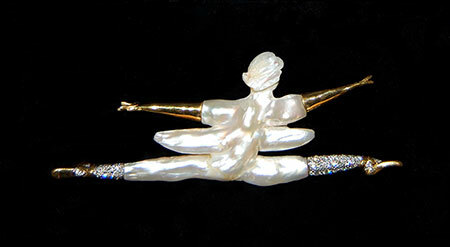 “Pearls” also includes examples of jewelry and more from the 17th, 18th and 19th centuries. Delicate Art Nouveau creations of the turn of the 20th century will contrast the opulence of the past and future. (A Nouveau-era tiara, fashioned in the likeness of a semicircular branch of forget-me-nots, was beautifully executed by Paul Gabriel Liénard, Paris, 1905. The branch is gold, the leaves and petals are of horn, with pearls and diamonds playing the part of buds and pistils.) Also exhibited will be examples from India, China, Japan and Russia. Even melo pearls will be represented, by a pair of melo and brown diamond earrings. 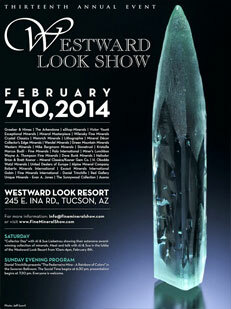 See our ad in this year’s program. 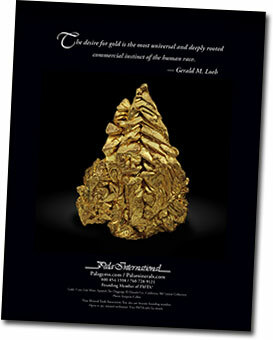 This “Christmas Tree” gold specimen will be displayed as part of the Munich Show’s special exhibit, “Gold.” This specimen is featured in an 1886 catalogue, “Collection of Minerals of A. Dohrmann, Esq., Catalogued by S. H. & H. Chapman.” We will profile this specimen in our October 1 edition of Pala Mineralis. One need not leave Southern California to take in some nice eye candy. 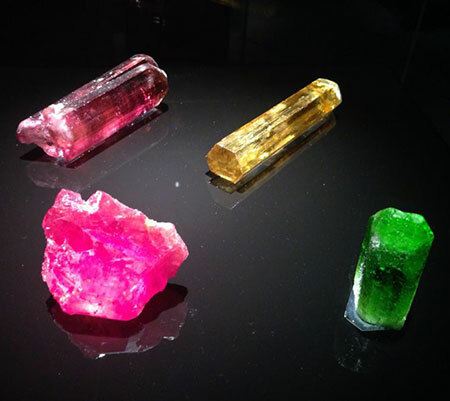 The Natural History Museum of Los Angeles has extended its exhibition of five colored diamonds of different hues. “Only five?,” you may ask. The Lady Heart Diamond Collection is remarkable because it pairs the rarity of colored diamonds with the rarity of the diamond shape itself. Allow the collection’s designer, Bernard Bachoura, to explain. While the diamond is in the rough, the final shape of the stone is determined by the diamond cutter based on which shape will best maximize carat weight, symmetry, and value. The unusual heart shape requires the cutter to sacrifice significant carat weight in order to achieve the desired result. It makes the heart shape a risk the cutter must be certain he or she is willing to take. Each diamond in the collection has receive a grade by GIA of Fancy Vivid color, the best for a colored diamond. The exhibition has been extended through December 1, 2013. If you can’t make it to the museum, peruse associate curator Eloïse Gaillou’s blog entry on the exhibition. 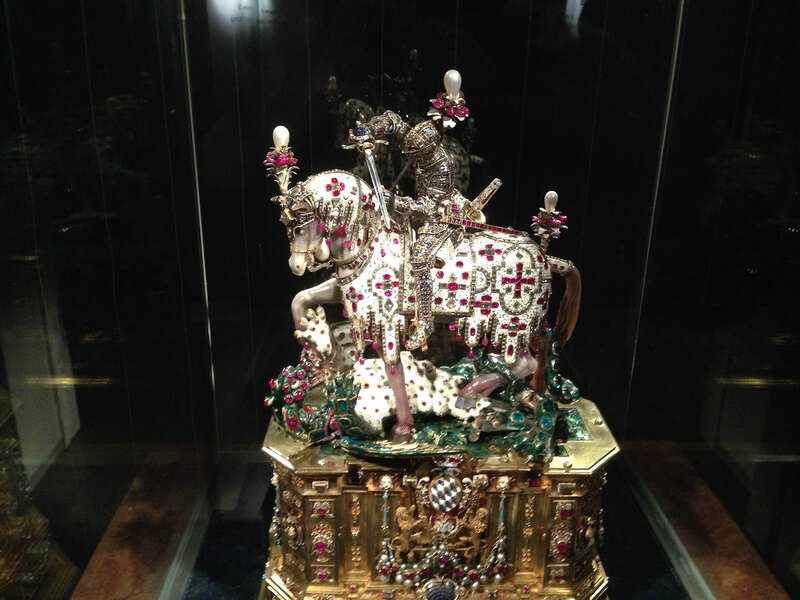 Also see her entry on “The Mystery of the Ring,” tracing back the origin of a gift to the museum, supposedly itself a gift from Catherine the Great to one of her maids of honor. 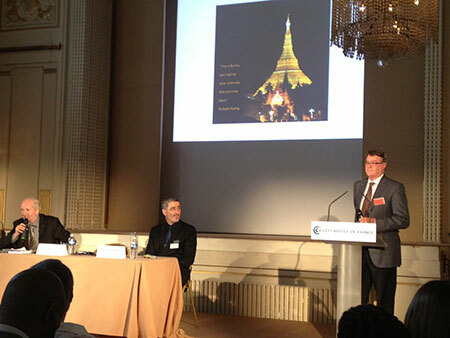 As we announced in July, Pala International’s Bill Larson was a featured presenter at the 13th (50th anniversary) Rendez-vous Gemmologiques de Paris on September 6. 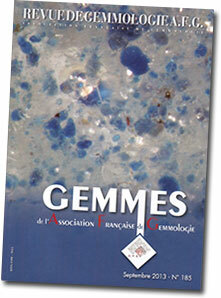 The sponsoring organization, Association Française de Gemmologie (AFG), celebrates its 50th year in 2013. So it’s only appropriate that the organization would mark the occasion with a list of fifty figures and events that have shaped the history of gems since antiquity. The finalists were chosen from a list of 193 nominees, all of which are listed in the September 2013 edition of the organization’s “Revue.” The list follows, in chronological order. Aristotle and Theophrastos; Pliny the Elder; Pedanius Dioscorides; Pyrgoteles and Dioscorides of the Aegean; Abū al-Rayhān Muhammad ibn Ahmad al-Bīrūnī; Navaratna Jewelry and Ratnapariska of Buddhabhatta; Louis van Berquem and Antwerp Diamond Center; Medici and Farnese Dynasties; Emeralds of Muisca and Pedro Fernández de Valenzuela Sotomayor; Bernardino de Sahagún and the Aztecs. Anselmus Boëtius de Boodt; Jean-Baptiste Tavernier; René-Just Haüy and Jean-Baptiste Louis Romé de l’isle; Antoine Laurent de Lavoisier and Louis-Nicolas Vauquelin; Jacques-Joseph Ebelmen and Paul-Gabriel Hautefeuille & A. Perrey; The Discovery of Diamond Deposits in South Africa; René J. Lalique; Edmond Frémy and Auguste Victor Louis (de) Verneuil; Edwin W. Streeter; Kokishi Mikimoto; George Frederick Kunz; India; Tolkowsky Family; Alfred Antoine François Lacroix; Tullie Cornthwaite Wollaston; Louis Marie Auguste Boutan; Chandrasekhara Venkata Rāman and Leonid Isaakovich Mandelstam; Georg O. 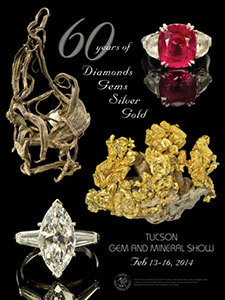 Wild; Eduard J. Gübelin; Basil William Anderson; Russian Diamonds; Richard T. Liddicoat; Synthetic Diamonds; John Sinkankas; Robert Webster; Campbell Bridges; Jacques Cassedanne; The Tucson Show; Joel Arthur Rosenthal; Kurt Nassau; Robert Wan; ICA (International Colored Gemstone Association); John Ilmarii Koivula; Henry A. Hänni; Emmanuel Fritsch; Richard W. Hughes; l’École de Nancy; HPHT (High Pressure High Temperature) Diamonds; Corundum Treatment; Laboratories, Tools Essential to the Gemstone Industry; Gemological Treasures from around the World. See the final program for the lineup of the meeting. The description of Bill Larson’s talk bears translation. William Larson « La mythique vallée de Mogok ». Bill Larson, le célèbre Président de Palagems.com a sillonné durant de nombreuses années de manière intensive tous les sites de la vallée de Mogok. William Larson “The mythical valley of Mogok.” Bill Larson, the famed President of Palagems.com toured for many years intensively all sites in the valley of Mogok. At the foot of the Master. 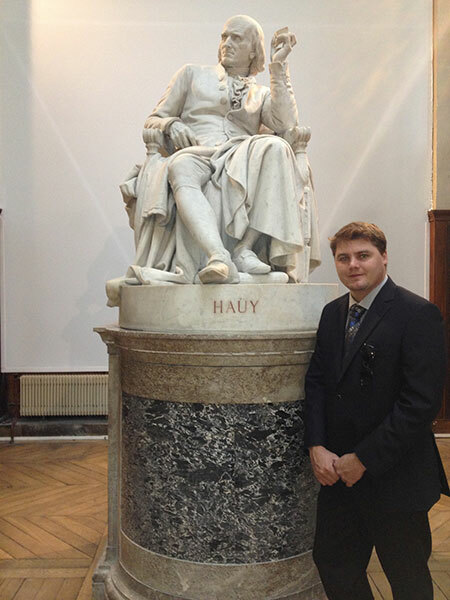 Pala International’s Carl Larson remains in Paris, working on a project at the Muséum national d’Histoire naturelle. Carl is to examine the collection of René Just Haüy, the père of modern crystallography, and No. 12 in AFG’s Top 50. He will compare the collection’s labels and their data against his own inspection. Attendees of the gem and mineral shows in Denver, which wound down this past weekend, might have noticed a curious structure in the parkway of Speer Boulevard at Larimer, just north of the Convention Center. Mine Pavilion is a site-specific architectural sculpture by art and architecture studio Pezo von Ellrichshausen, based in Concepción, Chile’s second largest city. Don’t forget “the main event.” As we announced last month, the Geological Society of America is holding its 125th Anniversary Annual Meeting and Expo in Denver, October 27–30, 2013. For the first time at a GSA meeting, GIA is sponsoring a topical session. “Gemological Research in the 21st Century: Characterizing Diamonds and other Gem Minerals,” featuring a powerhouse roster. Also of interest to colored gemstone enthusiasts is the cover story, “Carranza: The Myth and the Industry,” profiling the late “emerald czar” Victor Carranza, who passed away last April. Phenomenals seem to be making a subtle resurgence amongst gem connoisseurs. These colorful and magical jewels engage the senses and help us appreciate the dynamic chemistry and physics at work within the crystallized oddities. 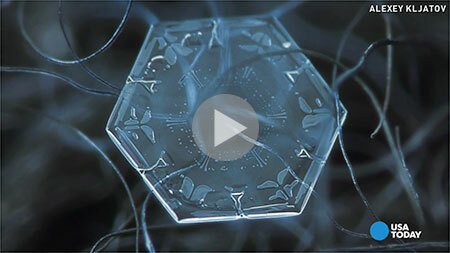 A feast for the eyes and a puzzle for the intellect. 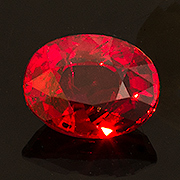 This Burmese star ruby exhibits a blazing, slightly pink, red hue with good translucency. 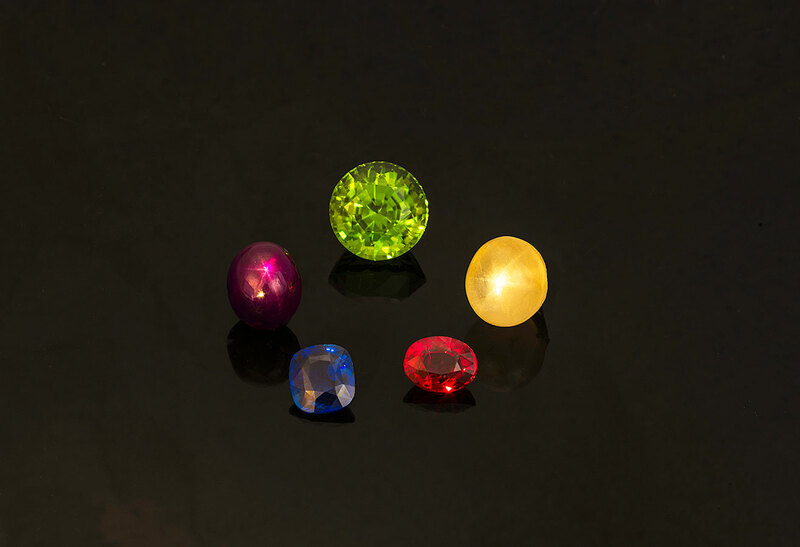 On top of the exquisite color lies an exceptional asterism with six well-defined and positioned rays. This cat’s eye seems to capture the best of a fine chrysoberyl. 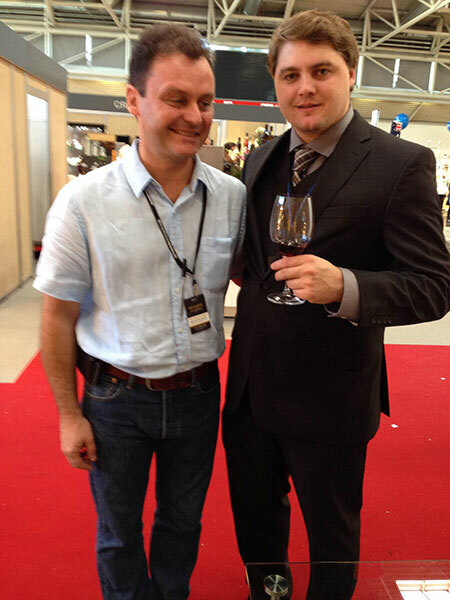 It displays a warm and pure milk-and-honey effect separated by a sharp white eye. This gem is also transparent, with only subtle internal graining tracing some of the structure. The stone is set in 18-karat gold with a precision bezel. It seems to be all Burma all the time here at Pala International these days. 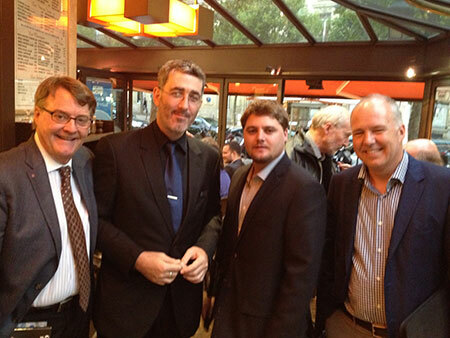 No sooner had Bill Larson delivered his presentation on Mogok in Paris, when he flew directly to Denver to present on Mogok and Burma jadeite at the Mile High Chapter of the GIA Alumni Association last Tuesday, to an appreciative audience of about 35—including Peter Maciulaitis, Bill’s roommate from his Colorado School of Mines days. 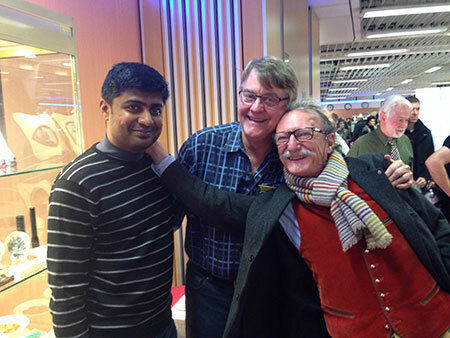 The two hadn’t seen each other in 45 years! 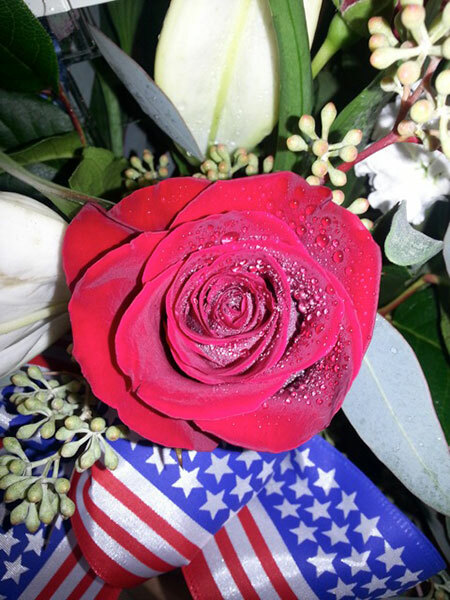 (The school’s museum has begun display of the Miss America crown, crafted of a variety of colored stones in a columbine design.) 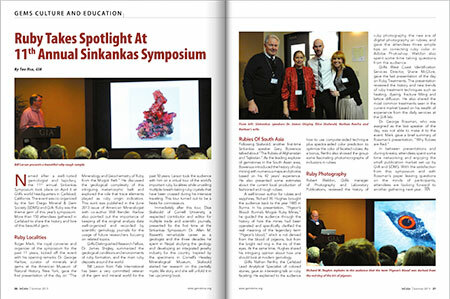 Then on Saturday, Bill presented on Burma at the Denver Gem and Mineral Show to a room of about 45. Invitation for the exhibition. (Click to enlarge) Richard Diran actually is a Renaissance man. 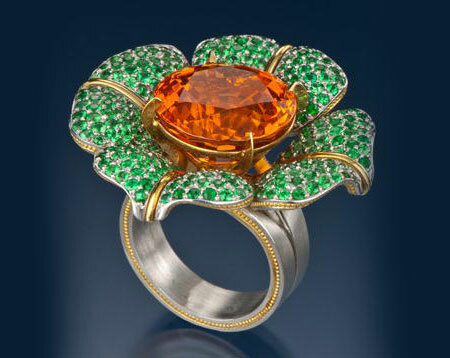 As well as being a writer (in varied forms) and photographer, Diran is a gemstone connoisseur. He also is a fine sculptor and painter whose work tells stories, depicting states of life and death, heart and mind. View examples on his website. 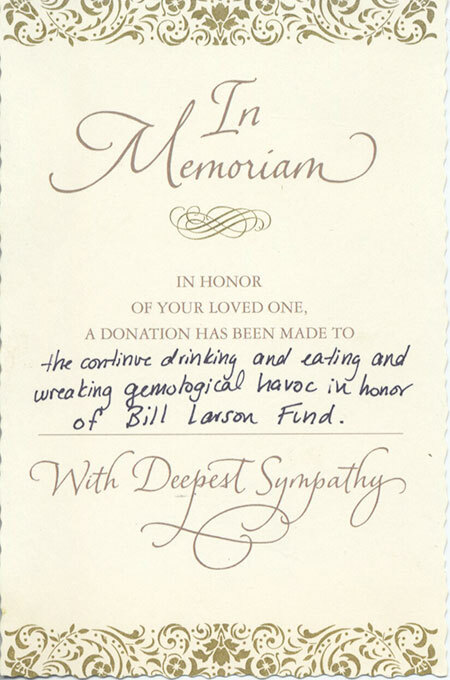 Bill now prepares for his 34th trip to Burma later this month with collectors George Hickox and Jon Sigerman. Upon their arrival in Yangon they will attend an invitation-only reception on September 28 for Bill’s longtime friend, the acclaimed author and photographer Richard K. Diran, who is presenting a three-day exhibition, “The Vanishing Tribes of Burma.” Invitees will be honored by Aung San Suu Kyi, who will open the event. Richard Diran’s photographs literally are a snapshot in time. His work represents the most comprehensive collection of visual documentation of Burma’s ethnic tribes whose cultural traditions, as portrayed in Diran’s images, are in many cases a thing of the past. The exhibition is funded by The Swedish Postcode Lottery, which routinely donates to charitable efforts; it is sponsored by The Swedish Peace and Arbitration Society in conjunction with Ar Yone Oo, a social development association in Burma. The aim of all is “to bring the issue of national reconciliation to the public eye through the inspiring images of the ethnic diversity in the region,” according to an announcement. Dusting off another danburite. Our photographer Mia Dixon found this lovely stone languishing, and gave it a close-up for Old Stock… New Pix. Inv. #21165 from Burma. The border also was the focus of an August 28 story in The Irrawaddy about the Central Economic Zone project being planned for Muse, which sits near the Burma–China border in northern Shan State. It is the most important border trading point between the two countries. Land is being snatched up by Burmese and Chinese businesspeople, causing real estate prices to rival those of the desirable areas of Yangon. The development is slated to include jade trading shops as well as hotels, supermarkets, recreation facilities and high-rise business buildings. The government is sending mobile teams to the trading points in order to halt illegal trade, according to the Shanghai Daily story. The success of such interdiction, however, is debatable. Eleven Media Group (EMG) reported last week that a paltry $80,000 (80 million kyat) worth of smuggled jade had been seized in Muse on September 3. From the bookshelf. 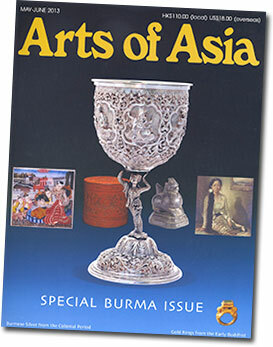 The May/June edition of Arts of Asia contains articles on the other “gems” from Burma: colonial silver, lacquer, painting, gold rings and more. 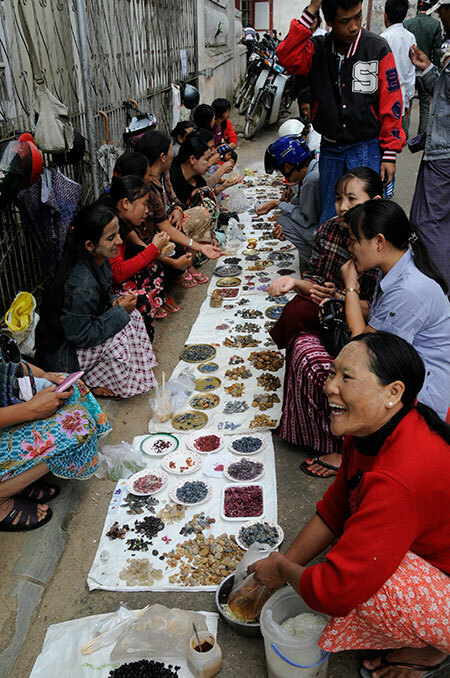 Contributing to the black market trade may be Burma’s “commercial” tax, as explained in a Myanmar Times story on September 1. Unlike income tax (tax on revenue minus expenses), commercial tax is levied on a company’s revenue, period. But it is not charged on the export of goods, with the exception of jade and gemstones (at 30%), lumber, natural gas and oil. Interestingly, the commercial tax rate for manufacturer to wholesaler usually is higher than from wholesaler to retailer. Interested parties have been visiting the ruby land of Mogok for months now, and this fact was reported in two recent stories. On August 22, EMG gave a brief overview of the opening up of Mrauk Oo (home of many notable stone pagodas from the 16th century) as well as Mogok. A Myanmar Times story last week noted that the savvy traveler should understand that luxury accommodations will not be in store: Mogok has only one hotel. The Ministry of Hotels and Tourism now is training 100 tour guides to prepare for increased demand. A local jade broker, Ko Zaw Min, remembered seeing only a single Japanese traveler in the area, who was there for a donation ceremony, and that was three years ago. From the archives. This story was reported in March 2012, but we didn’t find it stale. A purported 200-year-old carving of Burma jade, pictured above, is believed (hoped?) 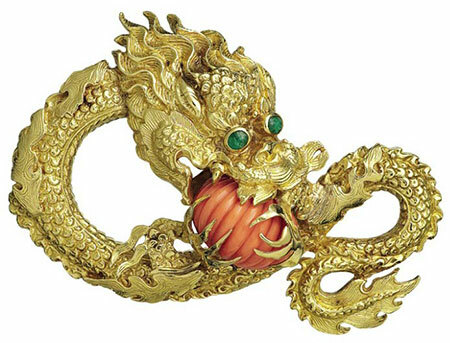 to have been part of the Chinese imperial collection in Beijing. 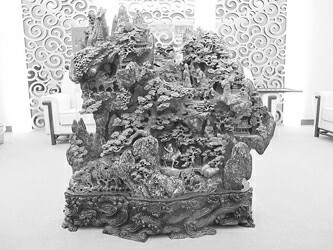 Weighing a half ton and measuring 98 x 115 cm, the carving was received with skepticism when it was found by accident during an excavation in Jiangsu Province. Read more at Shanghai Daily. Back in the 1970s your editor would browse the shops in what is now known as the “Sunset Junction” area, where Sunset meets Santa Monica Boulevards, in Los Angeles’ Silver Lake neighborhood, east of Hollywood, amid gay bars and bookshops, the fringe-y offerings of the Olio theater, and the after-hours comfort of the Crest Coffee Shop. A little jewel in that bohemian milieu was Soap Plant, the purveyor of ceramics and leatherwear (designed by the owners’ sons Peter and Billy Shire, respectively), gift and decorative items, artwork and, of course, artisanal soaps. By the 1980s, Soap Plant had moved west, to the trendy section of Melrose Avenue, into larger digs. Then-sole owner Billy Shire opened the midway-esque Wacko next door and, finally La Luz de Jesus Gallery, upstairs from Soap Plant. (The three enterprises moved back to East Hollywood in 1995.) We spent many an afternoon thumbing through the gallery’s selection of books on art, religion and culture, and dropped many a dollar there. Shire knew what he liked and he (and curator Robert Lopez) exhibited it with relish. For some artists, this was their introduction to viewers who would become their first patrons. A case in point is painter Manuel Ocampo, who, according to a 1988 story in the Los Angeles Times, was so poor he painted over used canvases, before having his first show at La Luz. Ocampo has gone on to be featured in the Bienniales of Kwangju, Lyon, Berlin and Venice. 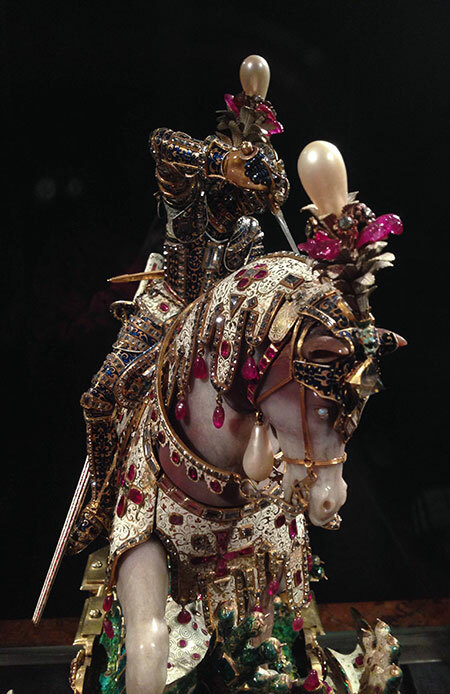 Given Shire’s predilection for the unusual, it’s no wonder that he would embrace the work of Paul Koudounaris. Schooled as an art historian, Dr. Koudounaris has studied the practice of decorating skeletal remains with jewels and other objects, a phenomenon that has taken him from the catacombs of Paris to the killing fields of Phnom Penh. 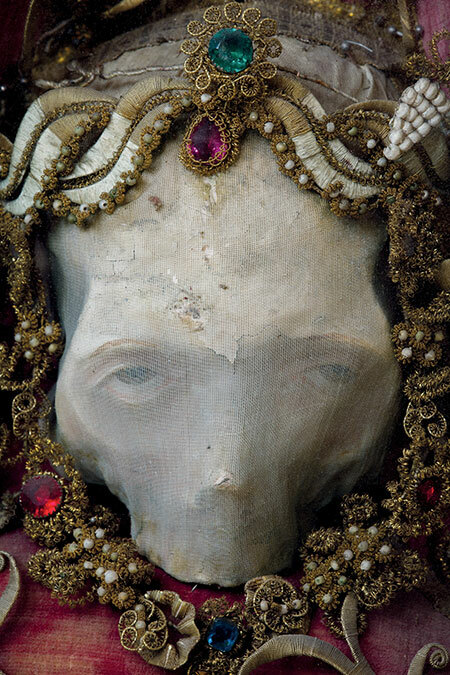 This historian’s photographs and commentary are the subject of two books, both published by Thames & Hudson: Empire of Death: A Cultural History of Ossuaries and Charnel Houses (2011) and Heavenly Bodies: Cult Treasures and Spectacular Saints from the Catacombs (2013). 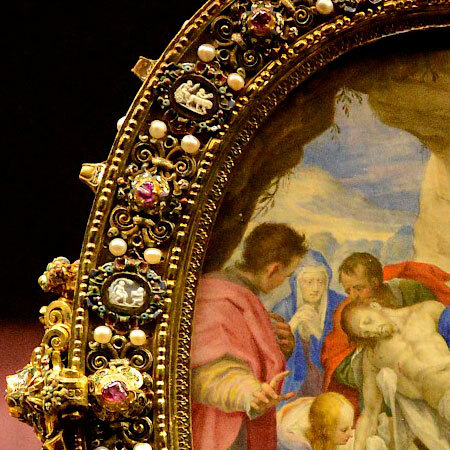 In the context of 16th century Europe, these bejeweled bones found their way from underground tombs in Rome that contained what were thought to be the remains of early Christian martyrs. 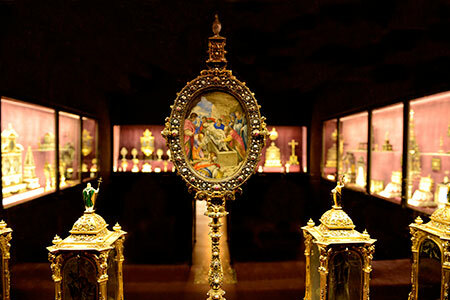 Discovered in 1578, there were thousands of them, and some also were thought to be saints. 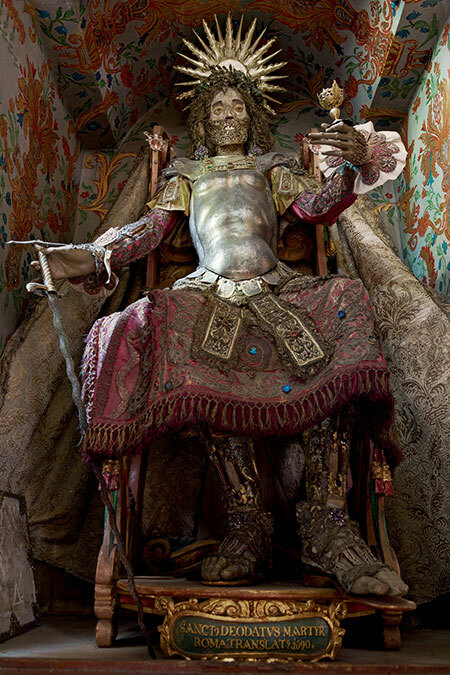 These skeletons were removed to Catholic churches in Europe and given an earthly, yet heavenly, reward, replacing the relics of saints that were destroyed during the Protestant Reformation of years before.